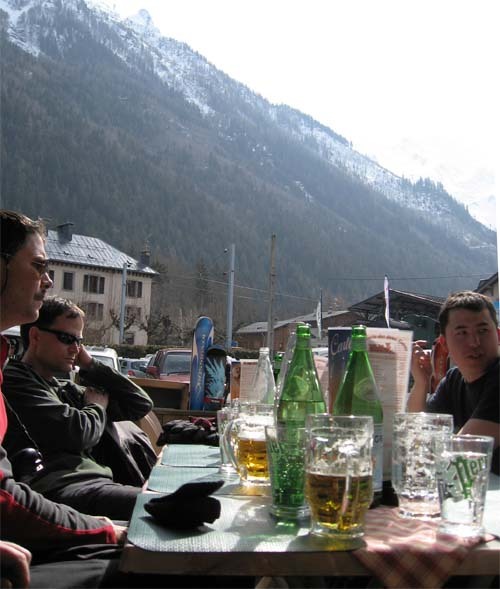 On 3/3/07 (Saturday) - 3/11/07 (Sunday) several of us met in Chamonix, France to go skiing. Most of us flew into GVA (Geneva, Switzerland Airport). Here is who showed up: Me (Brian Wilson), Mike Chow, Paul Wieneke, Brady Nilsen, Garth Eliason, Randall, Nick Walker, Lise Waring and Lance Waring. Below are some pictures from the trip. Click on any picture to get a HUGE version of that photo. Ok, on to this year's ski destination-> Chamonix, France! 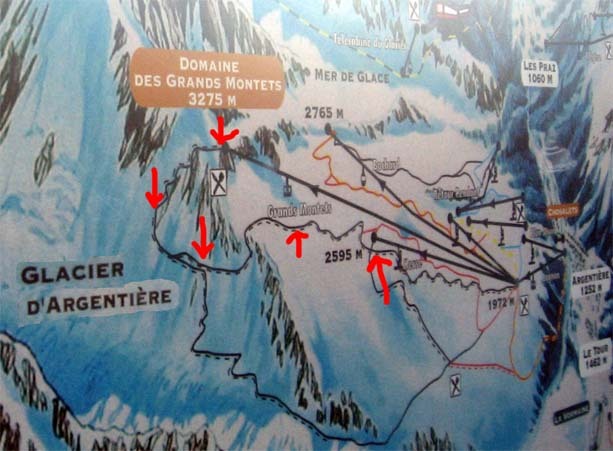 Below is a map of the area surrounding the town of Chamonix, with 5 ski areas underlined in red (and our Hotel pointed out). 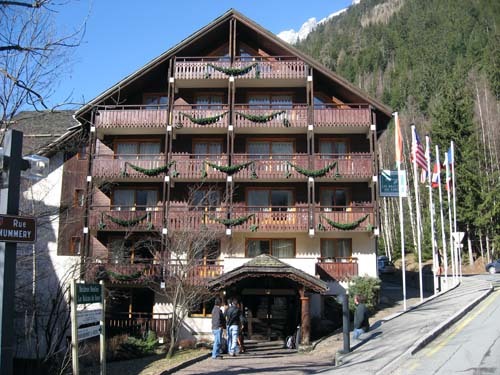 We stayed at the hotel "Les Balcons Du Savoy" which is slope side to the ski area "Le Brevent" which is interlinked to a ski area called "La Flegere" by a short horizontal tram ride. The largest ski area is called "Les Grands Montets". 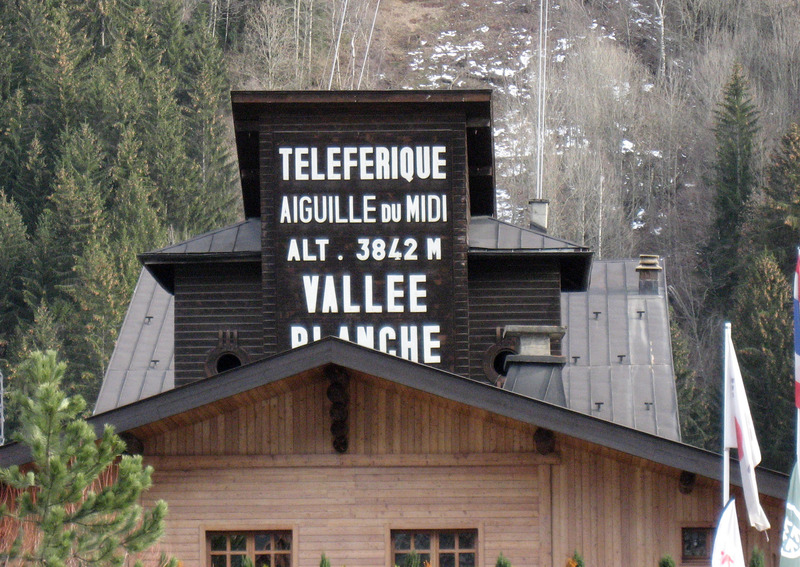 And at the far opposite ends of the valley are "Les Houches" and "Le Tour". Below is a high level map of the Chamonix Valley, all of the ski areas below are accessible by a free bus in the town. 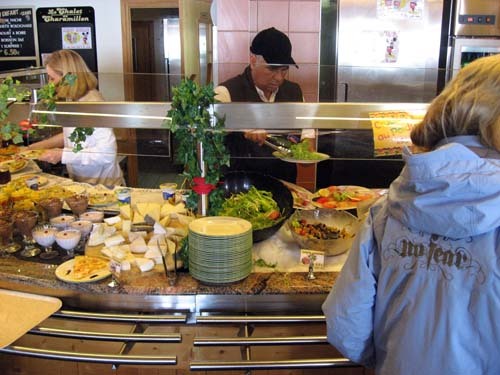 The ski areas share one lift ticket but ARE NOT linked together by lifts, and so you must choose on any one day which one of the areas to ski and stay there all day. 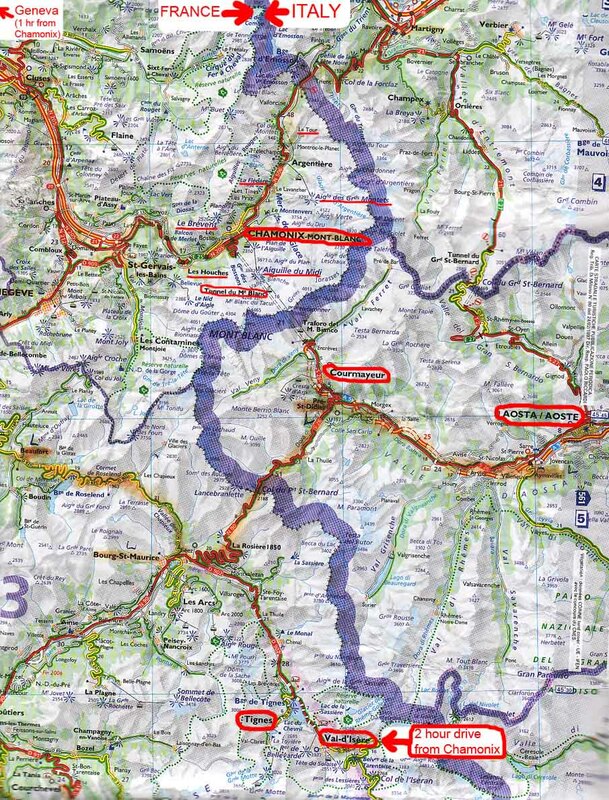 If you notice the big red circle line in the map below, and the big green circle line inside of it, these designate a different lift ticket (the "red" area encompasses more "off-piste" access and is little bit more expensive). Click on the map below to get a larger scale version. Most of us arrived into GVA (Geneva, Switzerland) on the same flight operated by Lufthansa and United Airlines on 3/3/07 Saturday. 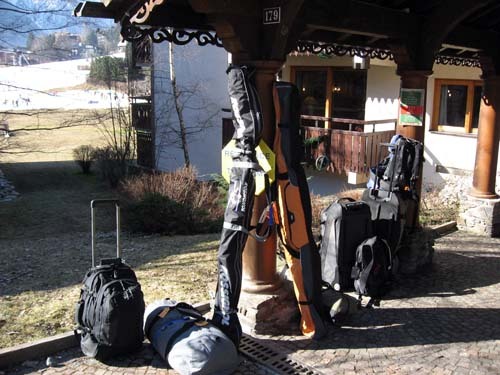 On the way, the airlines lost 9 out of 14 of our bags, including all 7 pairs of skis. You have to laugh at that kind of amazing baggage loss rate by the airlines! FedEx and UPS lose less than 1 in a million packages, and you can track your package locations at all times through a website interface. Contrast that with the airlines, where your non-stop flight arrives, and the airline stares at you blankly and says, "we have absolutely no idea where any of your luggage is". Wow. So we hopped in a shuttle called Mountain Drop Offs (http://www.mountaindropoffs.com) which is a cheap, convenient way to get door-to-door from the GVA airport to your hotel in Chamonix (you don't need a rental car for a week in Chamonix). The shuttle van broke down during the 1 hour drive where it couldn't go faster than 5 mph, and so limping along the shoulder we got pulled over by the Swiss highway patrol. 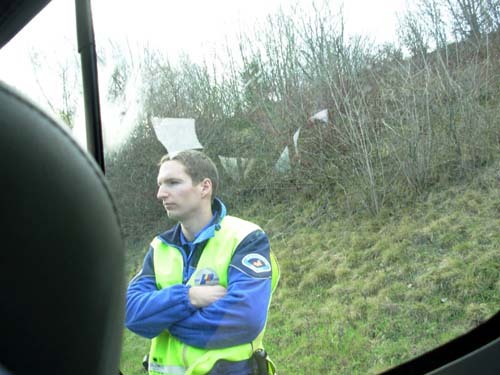 Swiss police officer watching us get lectured by the other officer to not drive on the shoulder. 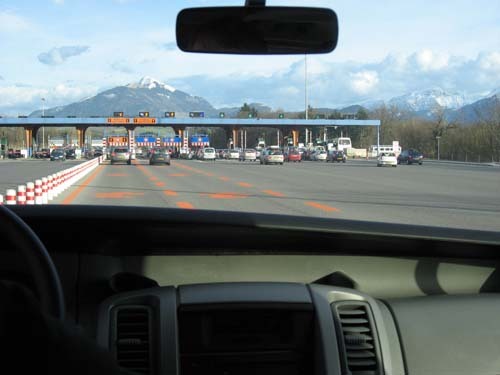 One more mile down the road, here we are at the border leaving Switzerland and entering France, waiting for the replacement shuttle van and driver to show up. That's Garth in red below laughing at our situation (lost luggage, broken down shuttle). Back on the road 15 minutes later in the replacement shuttle. 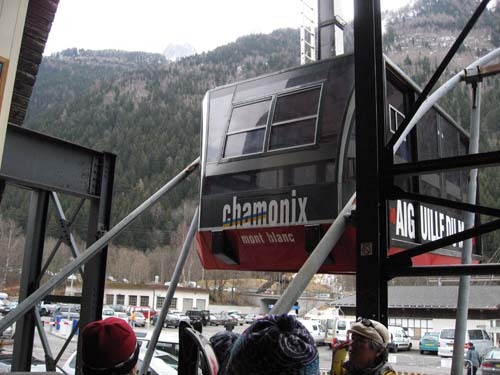 The next morning of 3/4/Sunday we woke up in our hotel in Chamonix, France on a beautiful sunshiny day, unfortunately without any of our skis because the airlines lost them. 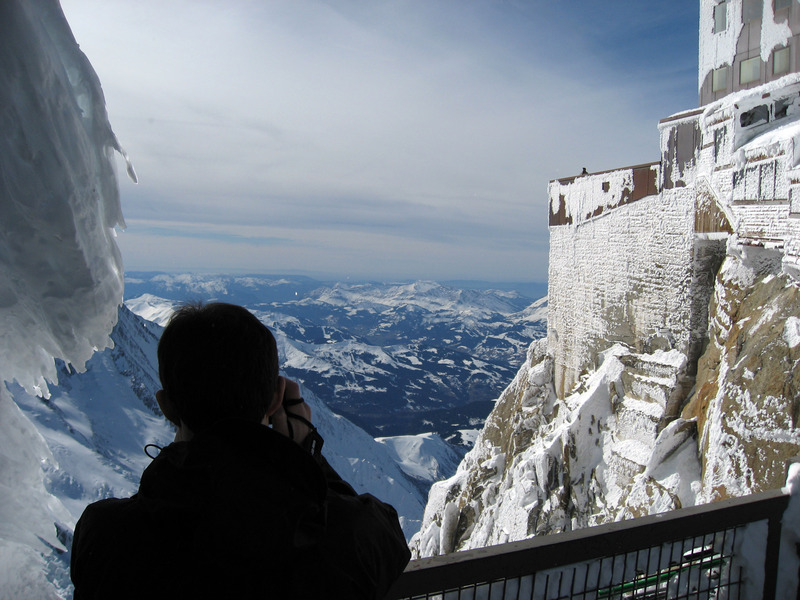 :-) So we decided to go site seeing, wander around town in Chamonix, then go to the top of the most famous tram in Chamonix which is called the "Aiguille du Midi". Below is a picture I took in the morning from our hotel room balcony window. 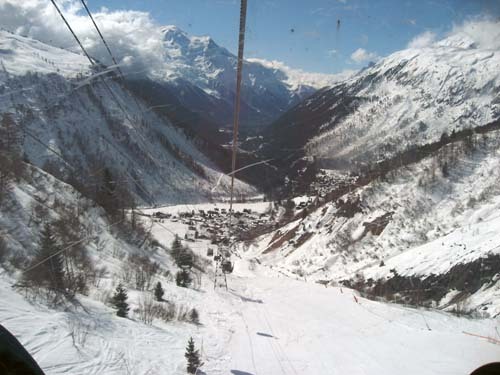 The ski area you see lifts to at the bottom of the picture is Le Brevent. 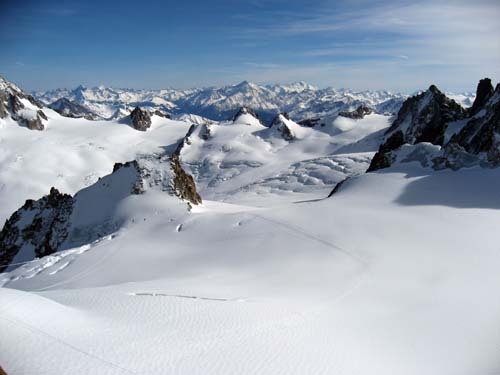 Off the upper left of the picture (not visible) is the Aiguille du Midi tram and the summit of Mont Blanc. At breakfast, here is the group from left to right: Mike Chow, Randall, Lise Waring, Nick Walker. 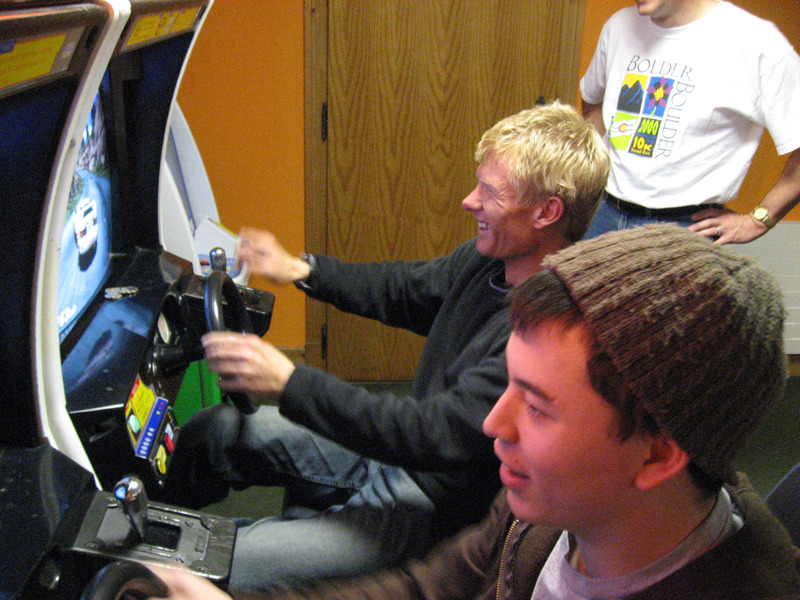 From left to right: Lance Waring, Brady Nilsen, Paul Wieneke. 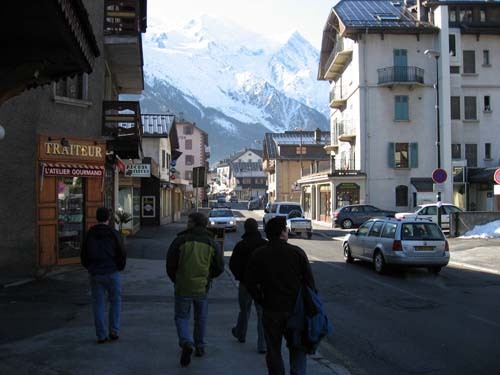 Walking through the town of Chamonix, France. 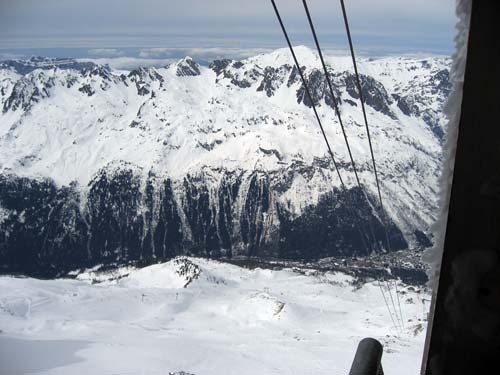 We are going from our hotel to the "Aiguille du Midi" tram. 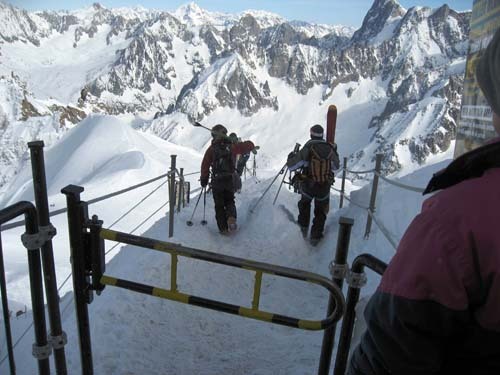 This is the bottom of the "Teleferique Aiguille Du Midi Tram". 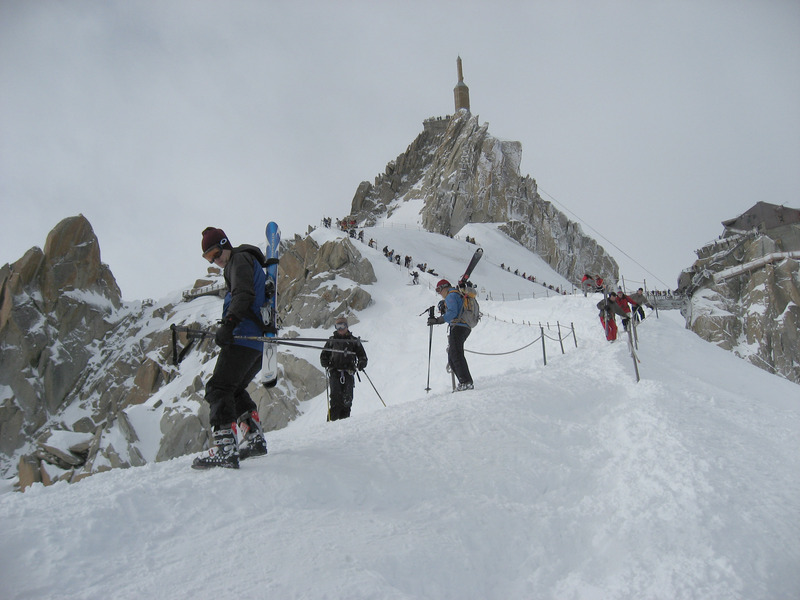 "Aiguille Du Midi" is the mountain peak and translates to something like "Mountain Peak in the Middle". 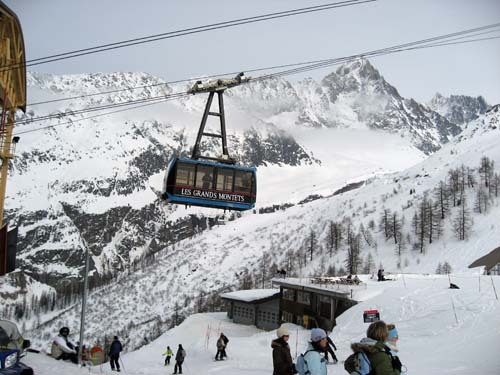 This tram is the highest in Europe at 12,605 feet. 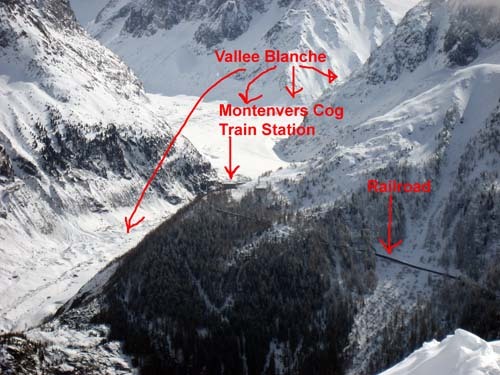 Among other things, it provides access to "Vallee Blanche", which is a very famous "off piste" (out of bounds, ski with guides, shovels, avalanche beacons) ski run. Vallee Blanche is the longest ski run in the world (13 miles long), and during that ski run you descend an amazing 9,000 vertical feet. The tram was thought up in 1905, the first sections were built in 1924, and the tram finally reached the very top around 1954. When it is open during the summer, you can take the "Helbronner Cable Car" from the top of Aiguille Du Midi on an amazing 5 km, 1 hour traverse over to Italy. 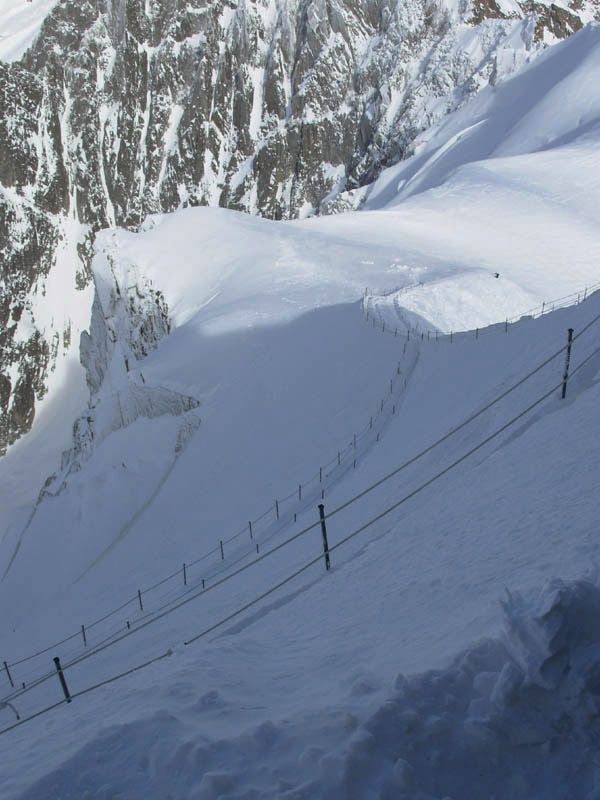 There are two separate trams you take to get to the top, here we are at the half way point which is called "Plan de l'Aiguille" looking up. There aren't ANY ski lifts around here, and all the skiing is "off-piste" (out of bounds). 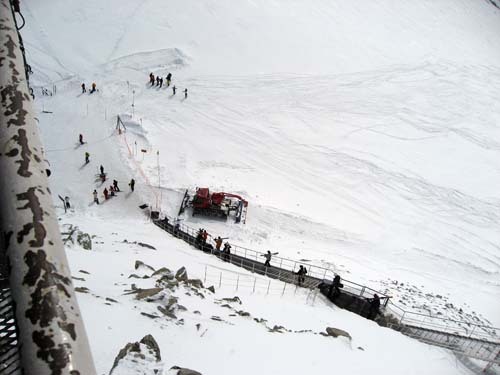 In the picture below we see that some skiers have successfully descended from the top and are coming into the mid-point tram stop. See the red arrows to see the skiers (click on the picture below for a larger version). Now look up at the picture directly above to see what these skiers have successfully descended from. 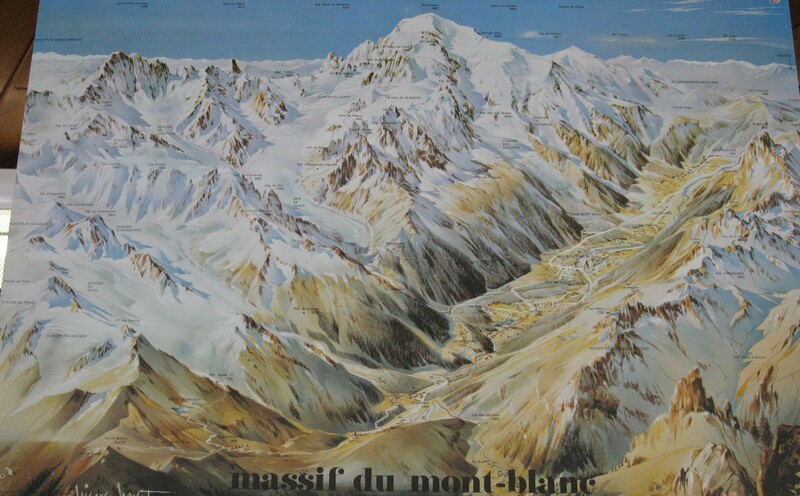 The next 3 pictures aren't mine, they are maps and scanned in postcards just to give you an idea of what the top of the Aiguille Du Midi Tram in Chamonix is all about. 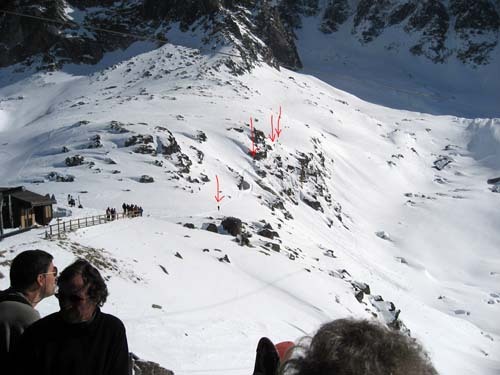 Below is a picture of where we arrived (notice the "Top Tram" in bright red). 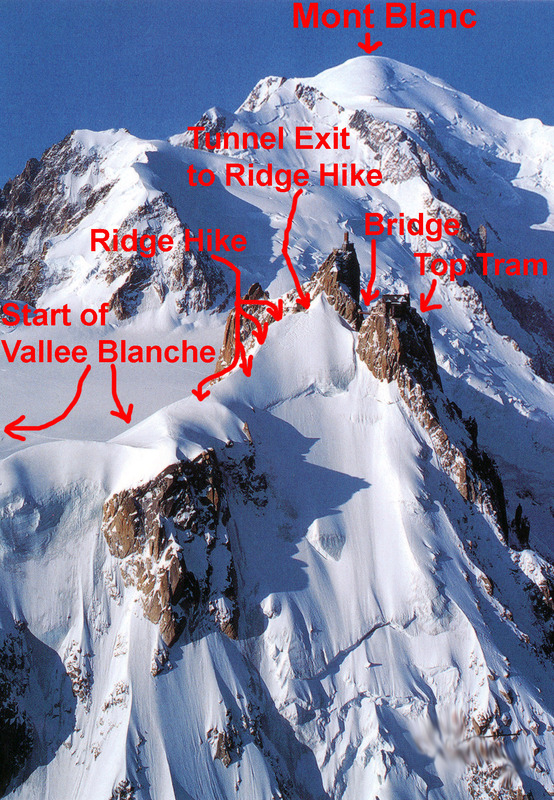 To ski down the Vallee Blanche, skiers must first hike down a dangerous ridge (notice the "Ridge Hike" in bright red). 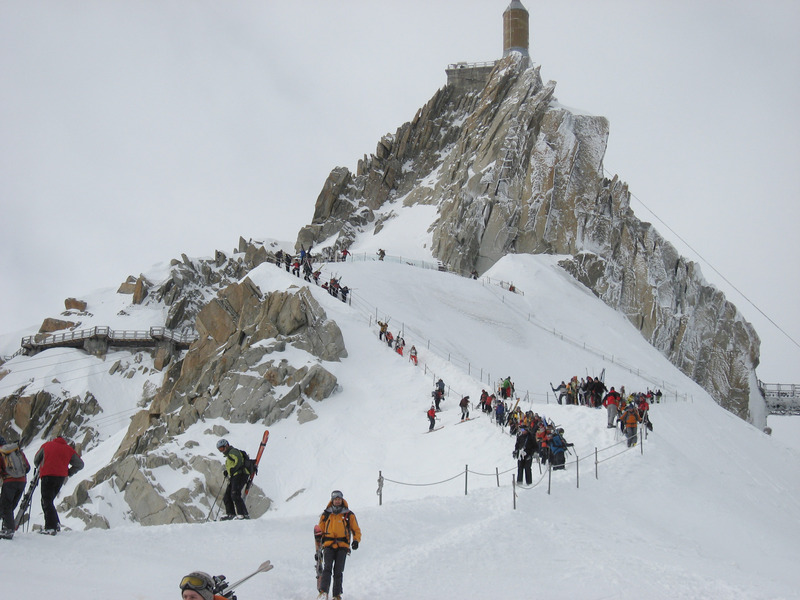 The ridge is called "The Ar�te" and people fall to their deaths every year walking down it. On each side is a 40 degree drop off, as you walk down if you slip off the left as near as I can tell your dead body will slide all the way into the town of Chamonix 9,000 feet below. Look closely at the picture below and see if you agree with me. Click on the picture below to see a larger version. 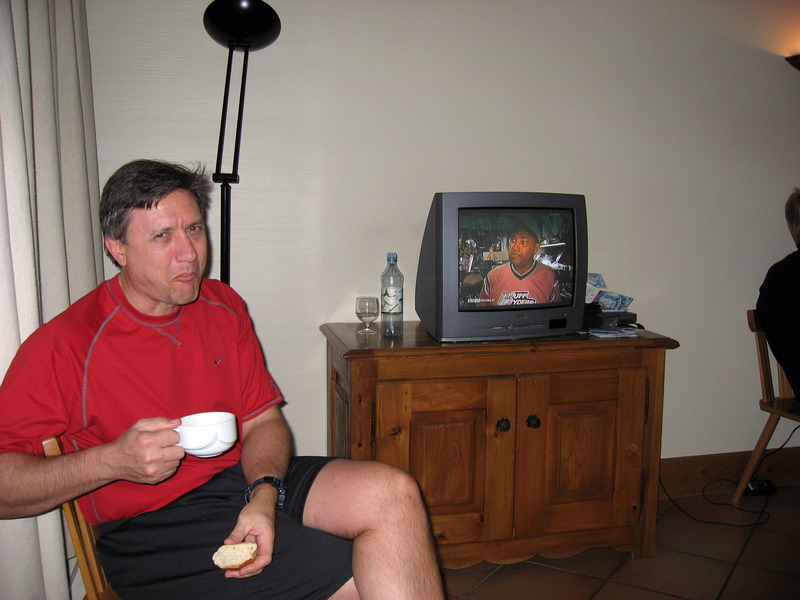 The picture below is the same as the picture above, without the ugly red annotations. 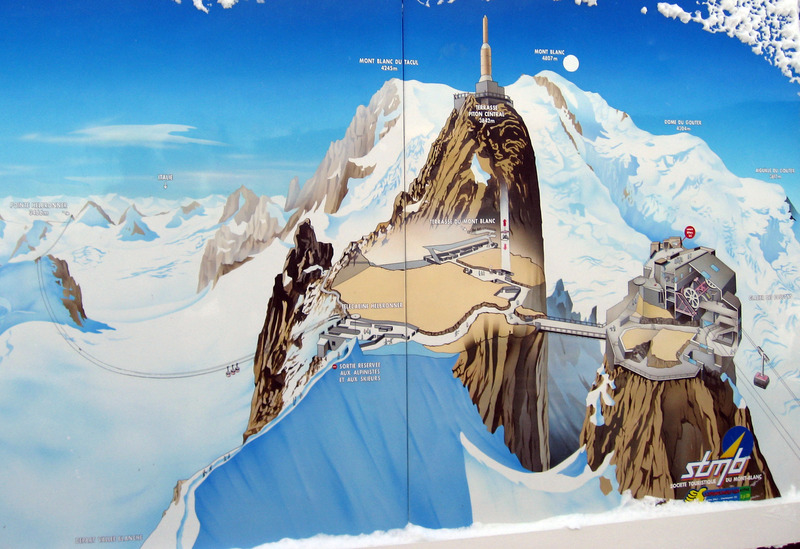 Below is a diagram/map of the top of the Aiguille Du Midi Tram. Click on that picture for a larger version. 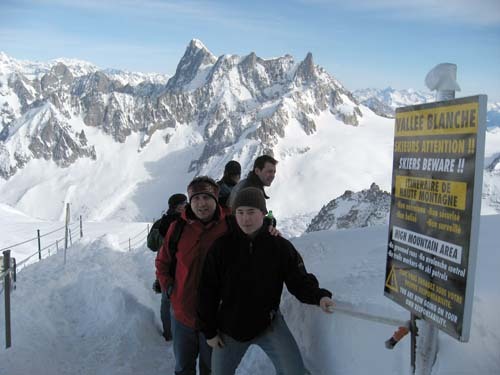 We're planning on skiing Vallee Blanche in a couple days, so we went to see the entrance. 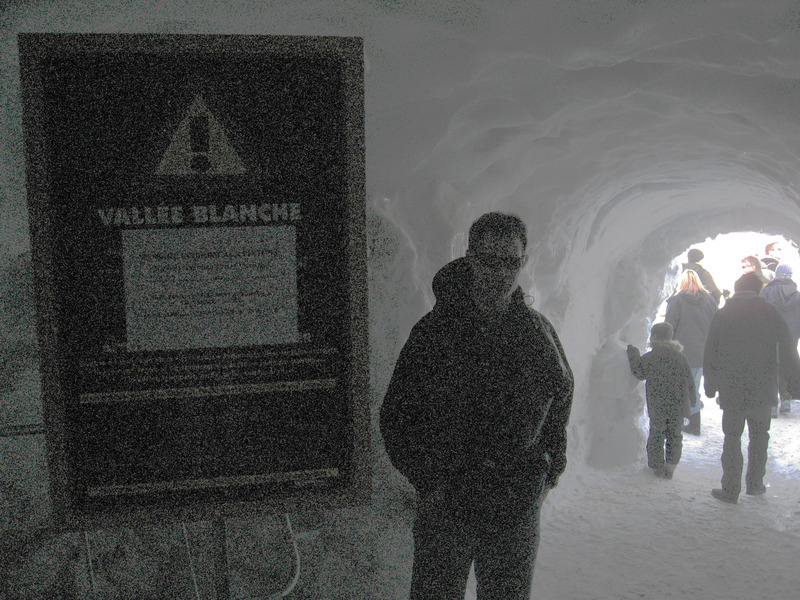 You walk through an ice tunnel to get to the entrance, here is Brady standing next to the "Warning: No Tourists" sign. 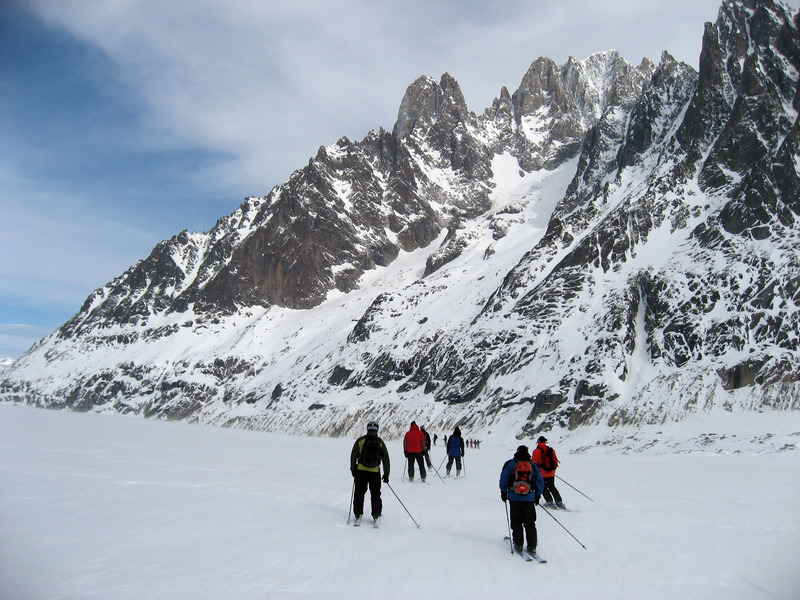 This is the start of "Vallee Blanche", and specifically the beginning of the "Ridge Hike" called "The Ar�te". They provide ropes to hold onto, but people still fall off and die each year. Here is a picture I took much later at a much different angle showing the hike down. To the upper right of the picture is the entrance to the tunnel, and there is a switchback with ropes showing the way you walk down. 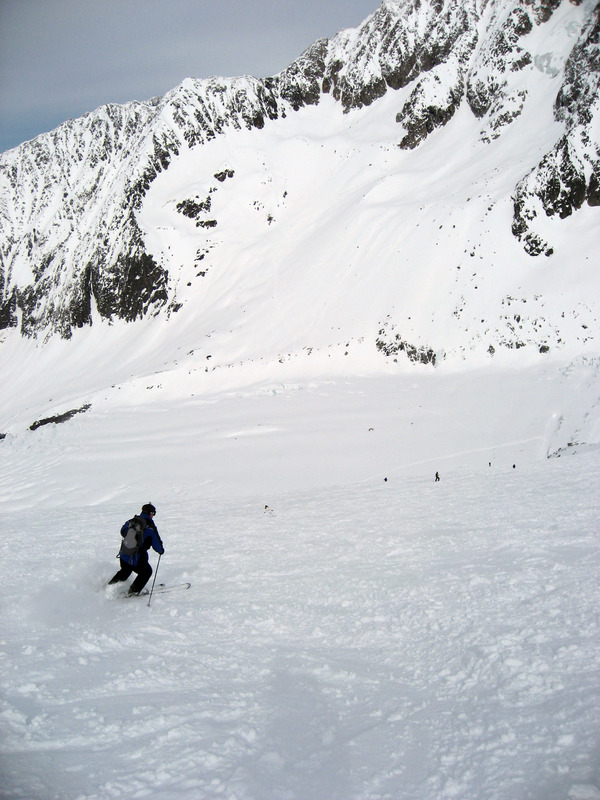 Skiers put on their skis near the lower left corner of the picture below. 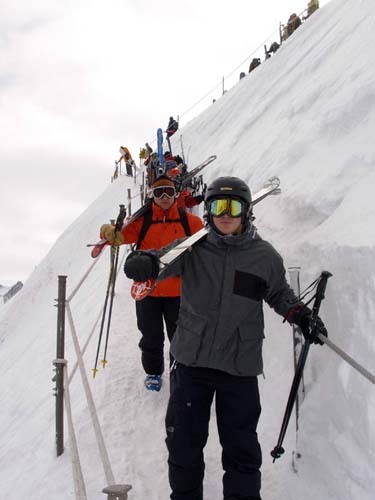 We're not skiing today, but below is Garth and Nick posing at the entrance. 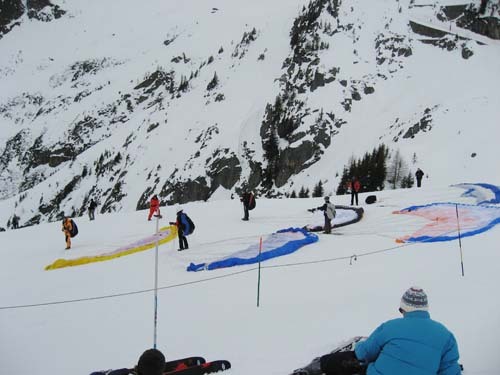 It is about 3pm, and the French woman below came out of the ice tunnel and is preparing for the descent. 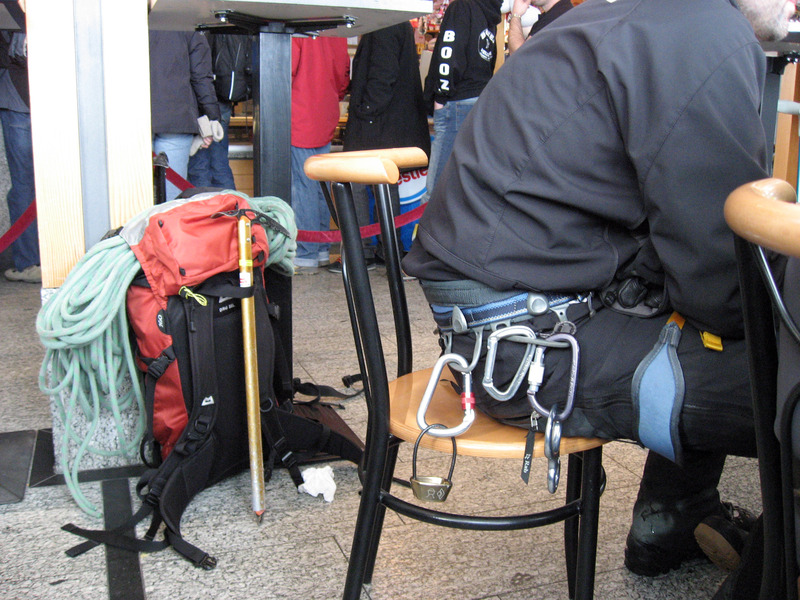 If you look closely, she is wearing an ice axe sticking out of her backpack, she has on a climbing harness through her crotch and waist, she is wearing carabiners (metal loops for attaching ropes). 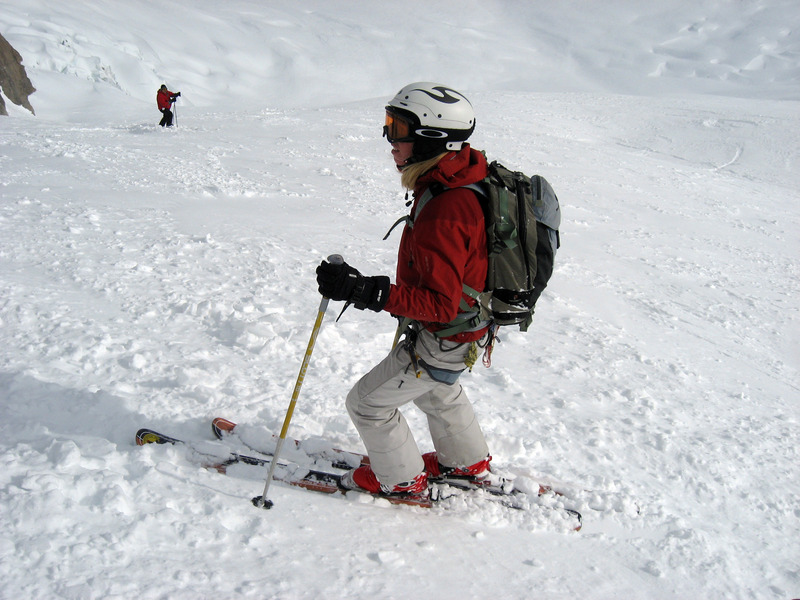 This is all gear for rescuing others skiers when they fall into a crevasse (crack in the glacier that opens up, sometimes covered by a foot or two of snow so you can never really know where they are). Below you see a few skiers about to embark on the ridge hike down to ski into Vallee Blanche. 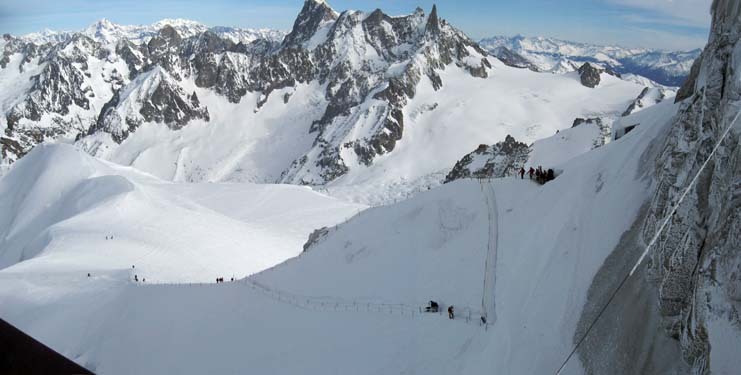 The picture below was taken from a different observation deck, but shows the top of Vallee Blanche. 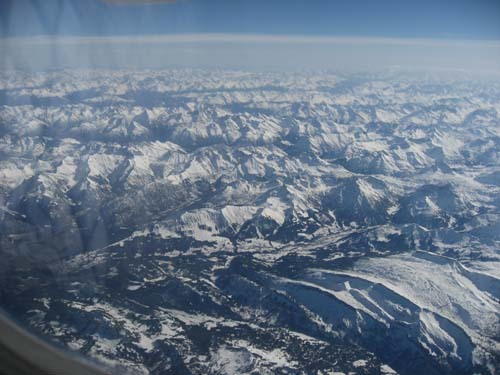 If you look closely (or click on the picture below) you can see a few ski tracks out across the expanse. Walking back through the tunnels through rock and ice at the top of the Aiguille Du Midi Tram above Chamonix, France. Here we are on the "bridge" at the top of the Aiguille Du Midi tram (see map and diagrams earlier in this page). Looking over the side of the bridge, you can't get a feel from this picture, but it's SUUUPER far straight down. Below is a panorama with the town of Chamonix in the lower left. 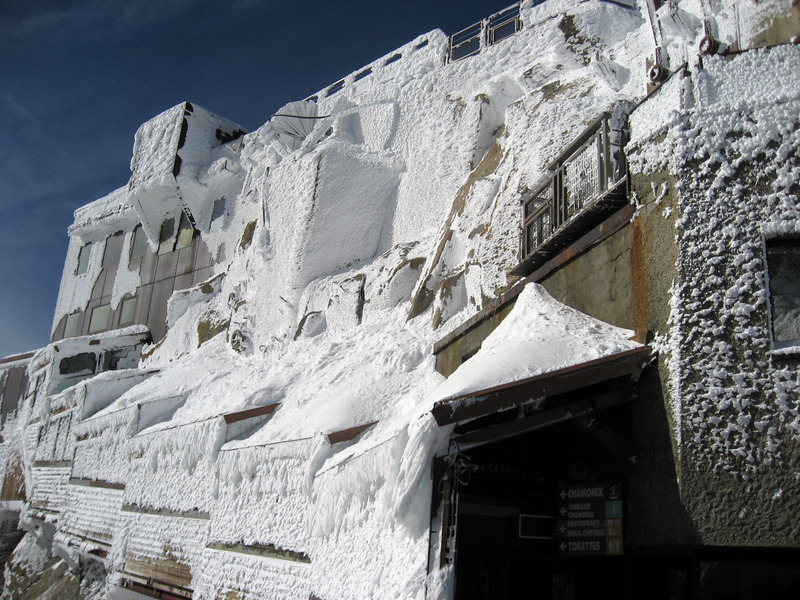 A picture of the side of the structure at the top of the Aiguille Du Midi tram. 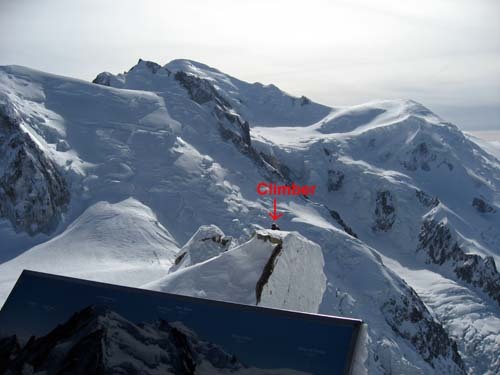 We are standing on the observation deck sipping our French coffee from the coffee shop, and the climbers (see red pointer below) come huffing and puffing up the vertical face from below. 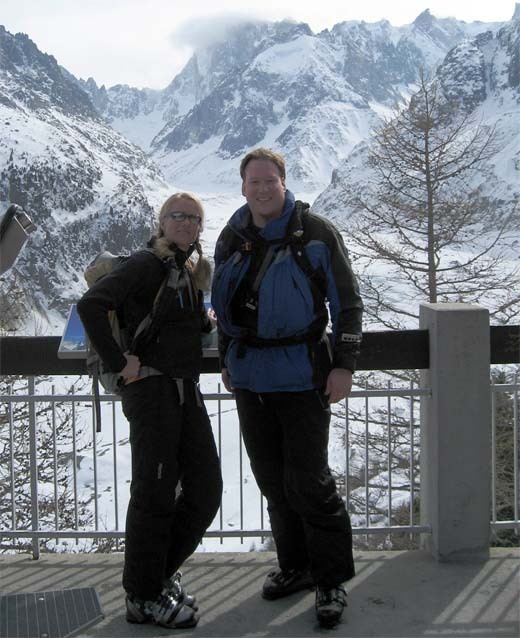 We took a tram, they CLIMBED up with ice axes and crampons! 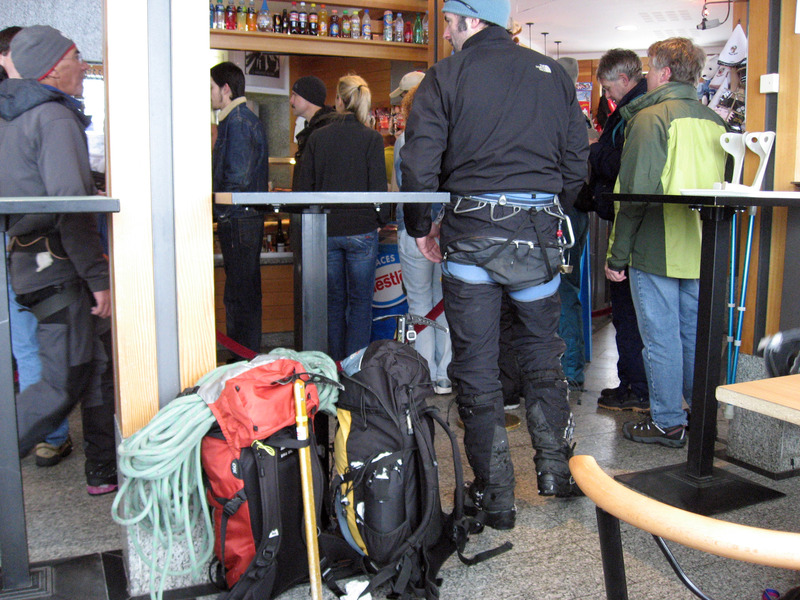 Here are those climbers a few minutes later in the coffee shop. 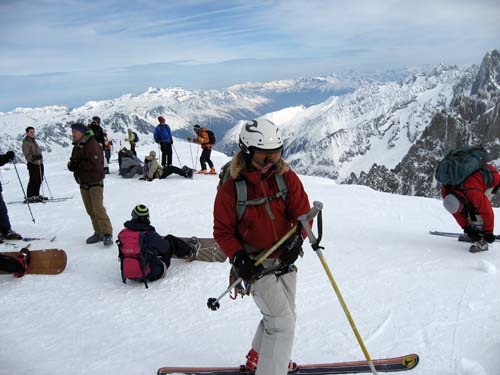 A close up of the gear they carried to climb to the top of Aiguille Du Midi. Another picture from the top. 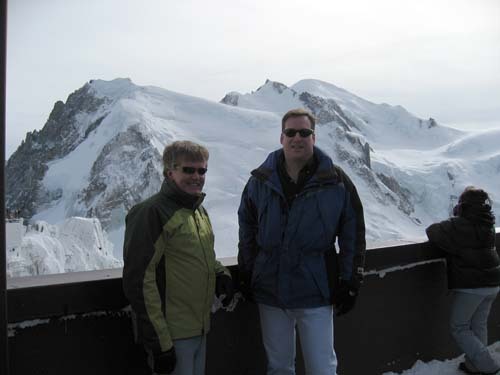 Paul and Brian (me) at the top of Aiguille Du Midi above the town of Chamonix, France. 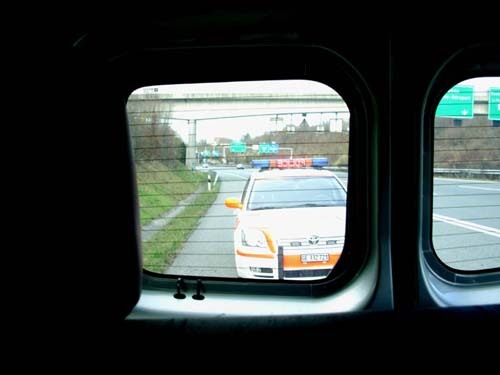 Brady took this picture. Below is Brady at the top of Aiguille Du Midi above the town of Chamonix, France. 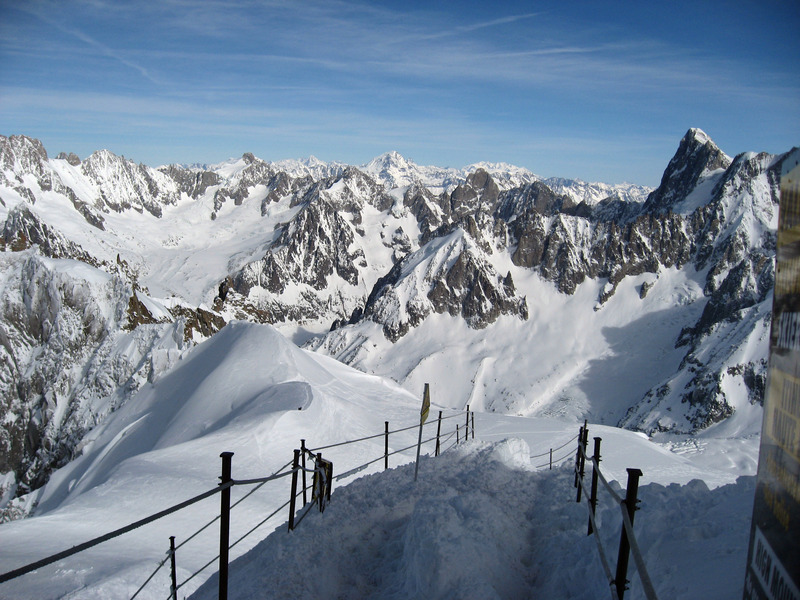 A panorama from the top of Aiguille Du Midi above the town of Chamonix, France. 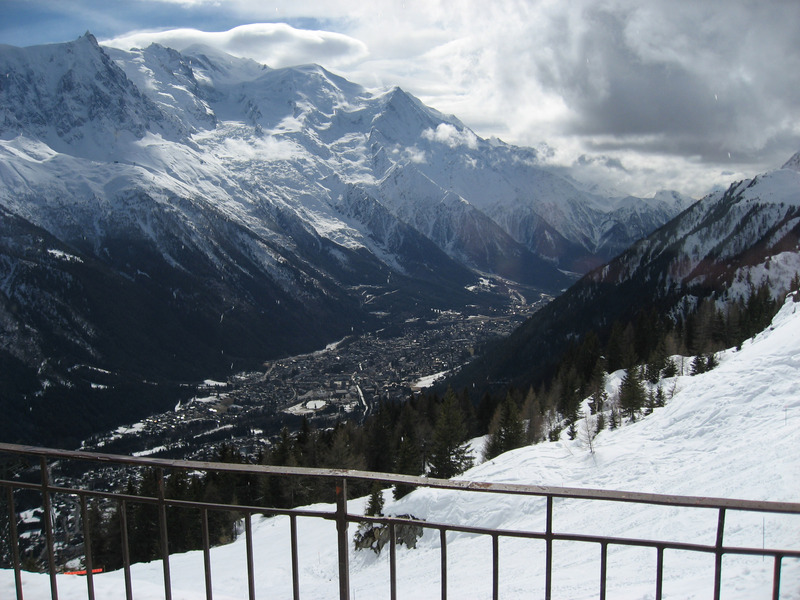 You can see Chamonix 9,000 feet below at the bottom of the valley. Our group, a little jet lagged and tired at altitude (we are at 12,600 feet here in this picture). 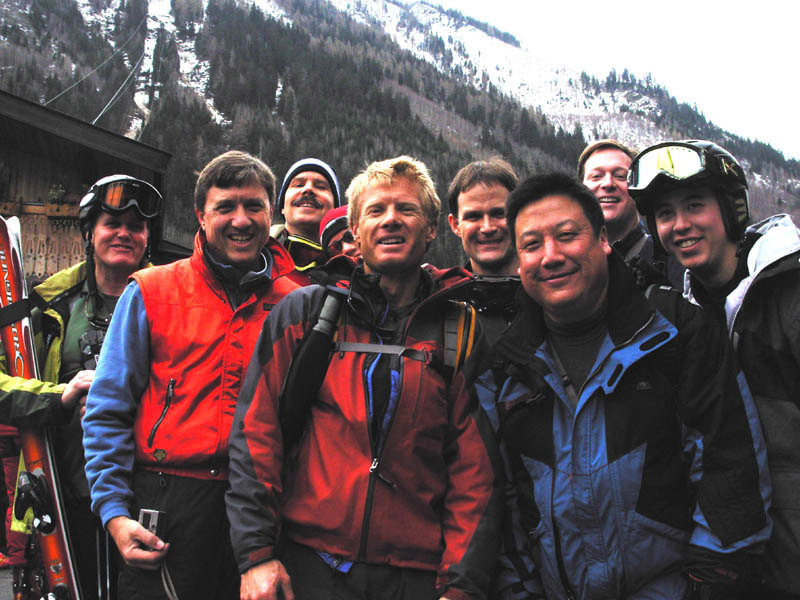 From left to right: Nick, Garth, Randall, Paul, Mike, Brady, myself (Brian) taking the picture. 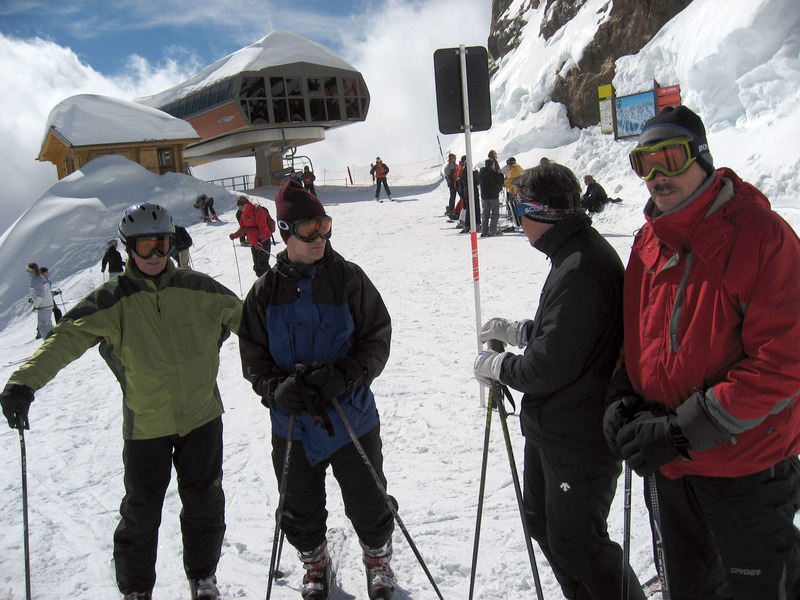 While we were out site-seeing, Lise and Lance picked up "Ed" (below in brown jacket) who was hitch hiking to the ski area. 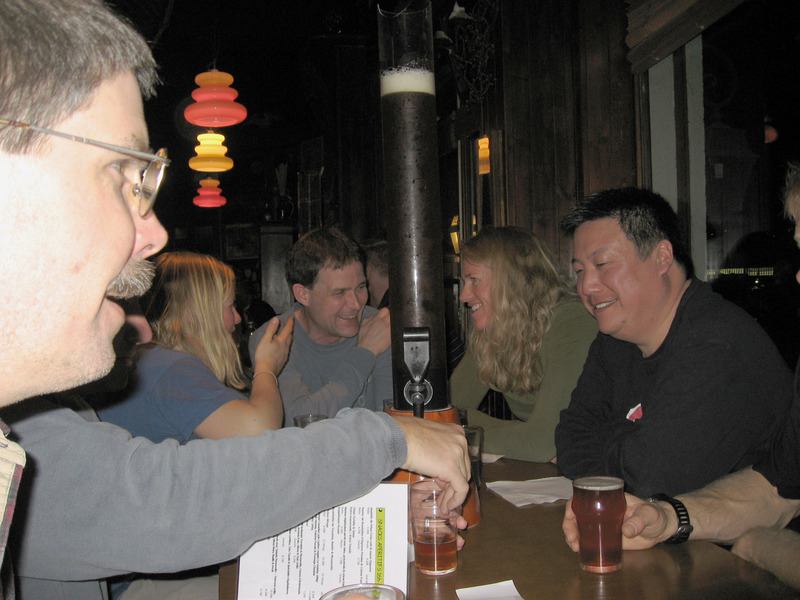 Lise on far left, Ed (our hitchhiker), and Lance at the end of the bar. On 3/5/07 (Monday) our lost skis arrived after being missing in the "airline lost luggage mystery zone" for 28 hours. 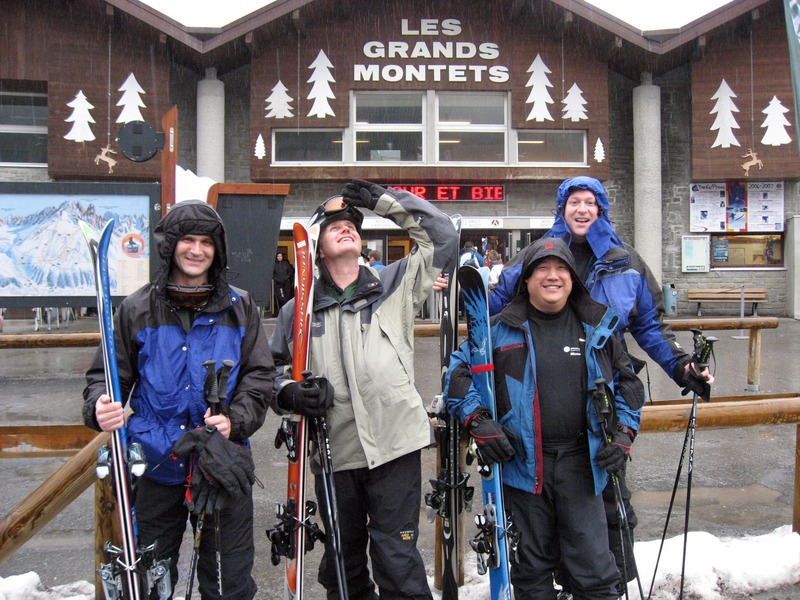 It was raining a bit, but some of us decided to go up skiing to get a warm up run in. 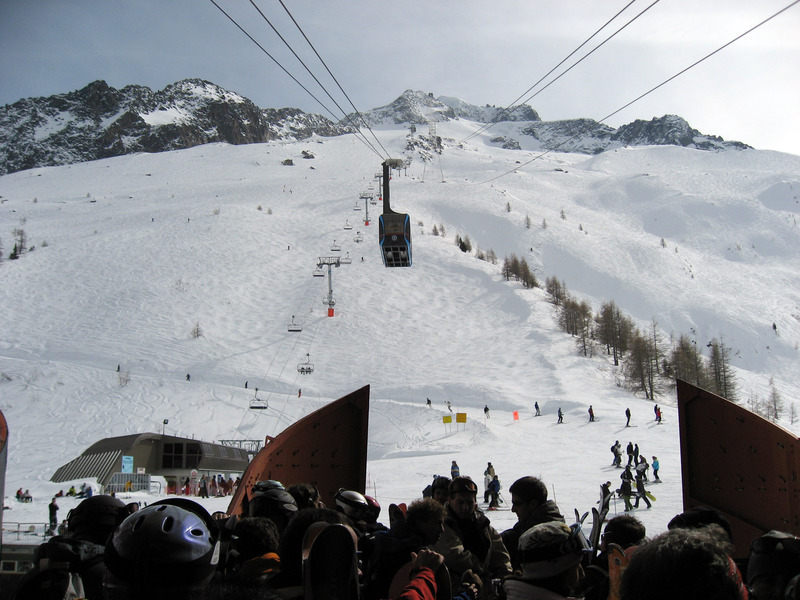 We went to the largest of the "on piste" ski areas, which is Les Grands Montets. Lise and Lance dropped us off in the rain, in the picture below it is: Brady, Paul (looking up), Mike, and Brian (me on the far right). 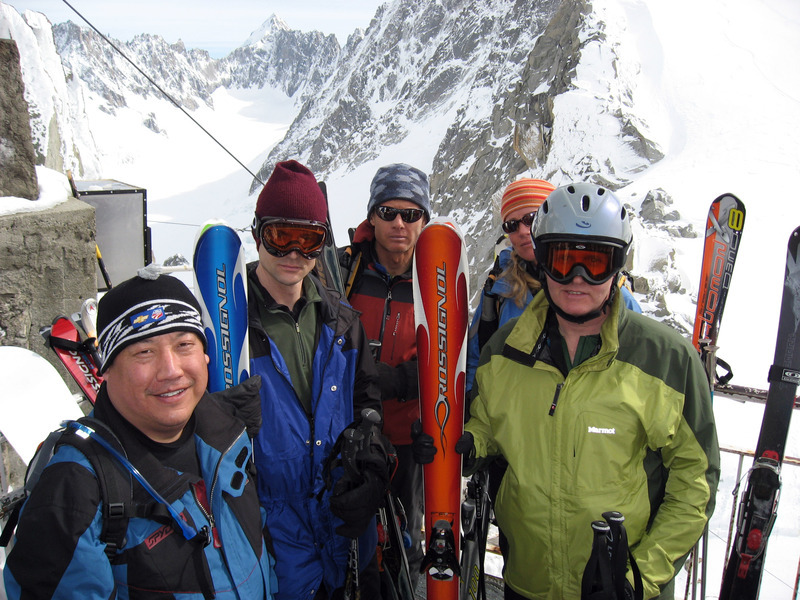 On 3/6/07 (Tuesday) the weather cleared up and we skied the famous Vallee Blanche. 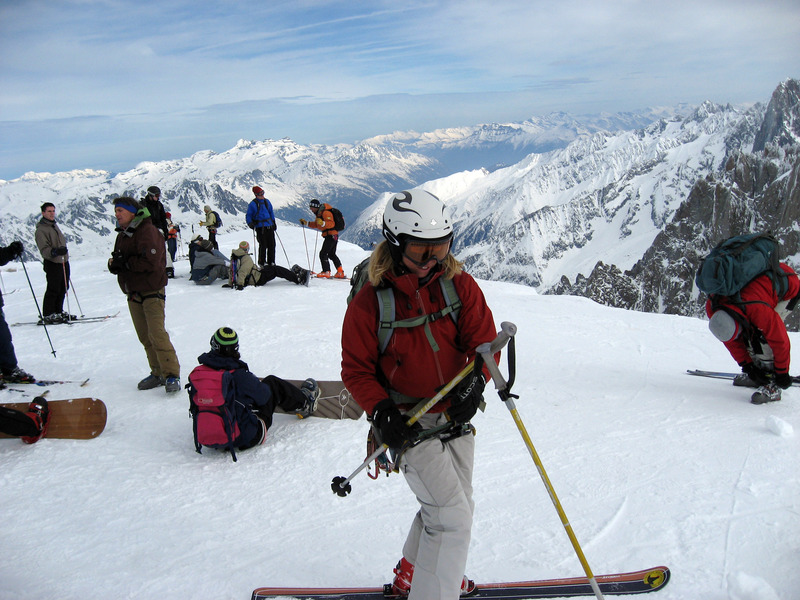 To do this, you would normally need a guide, but an old friend of Lance's (Gary Bigham) has lived in Chamonix for many years and was willing to show us the way. We also took avalanche beacons, shovels, avalanche probes, etc. 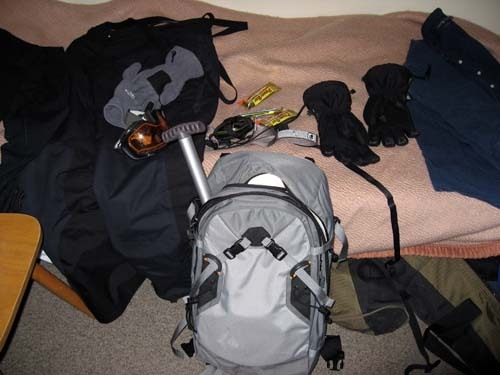 Below is some of my gear in the morning (that's the shovel handle sticking out of my pack). 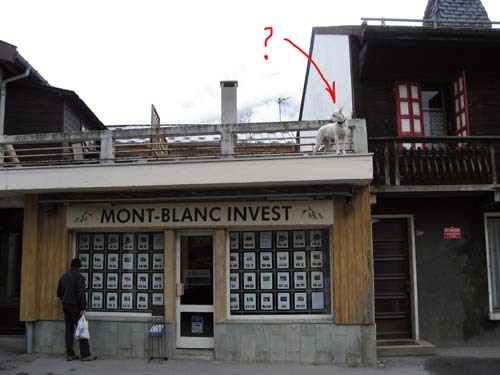 If you want to hire a guide service in Chamonix, here is a link: http://www.chamonix-guides.com (found this on a brochure there in Chamonix). 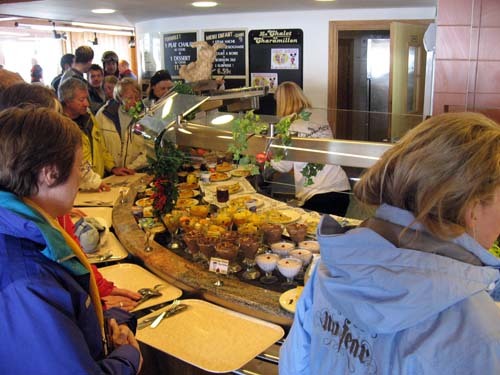 You can generally schedule a guide the day before you want to go, and it costs about 250 Euros (about $330 in US dollars) for a group of 4 tourists and one guide for a day. Early in the morning (around 8:30am) here is Brady outside our hotel in downtown Chamonix France, and that HIGHEST PEAK you see directly above his head is where we are going. It is the top of "Aiguille Du Midi" tram, the launching point to Vallee Blanche, near Chamonix, France. 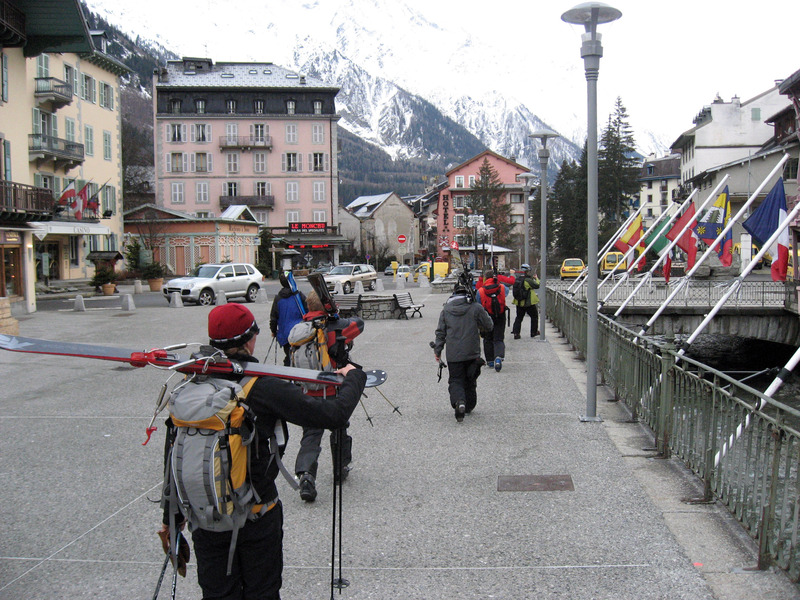 Walking through town with our gear on, heading for the "Aiguille Du Midi" tram. 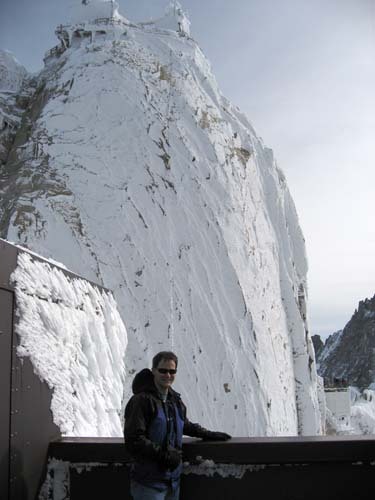 Here we are at the bottom of the "Aiguille Du Midi" tram. 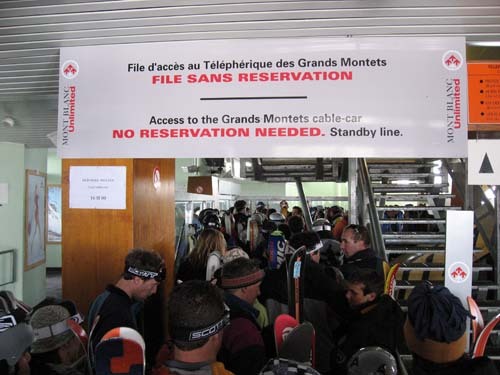 We made a reservation the night before to get on the tram at a certain time (9:30am). 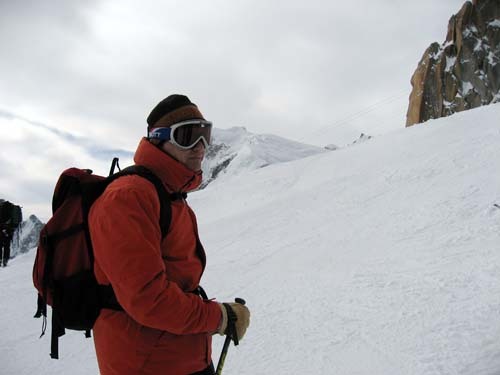 A picture of me wearing my avalanche beacon (the large thing around my neck). 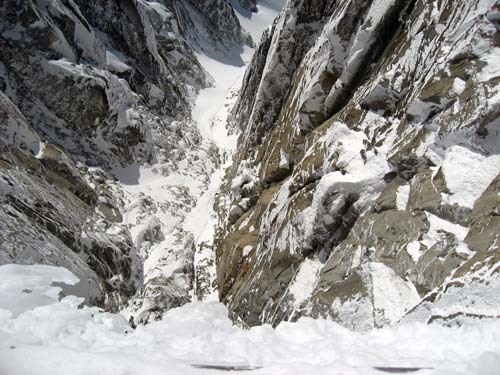 This transmits a signal, and if I would get buried by an avalanche the other members of my group could find me. 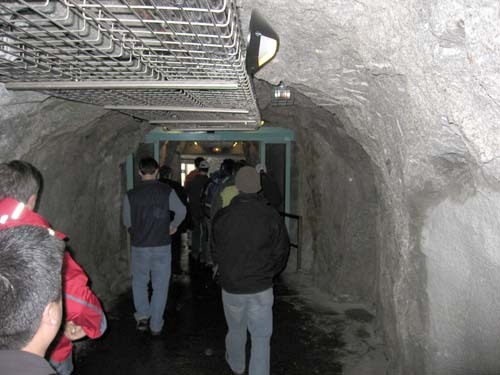 The beacon is ALSO the sensor you use to locate the buried beacons. You flip a switch and change from "transmit my location" to "search for buried people". 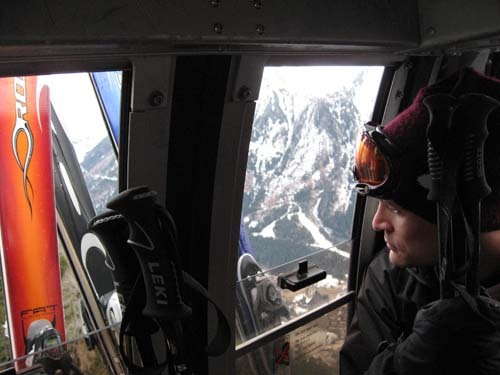 Everyone always skis with it broadcasting your location, then if an avalanche occurs, anybody who didn't get buried flips to "search mode" and looks for their friends. Brian (me), Lise, and Lance. We're killing time waiting for our tram reservation. 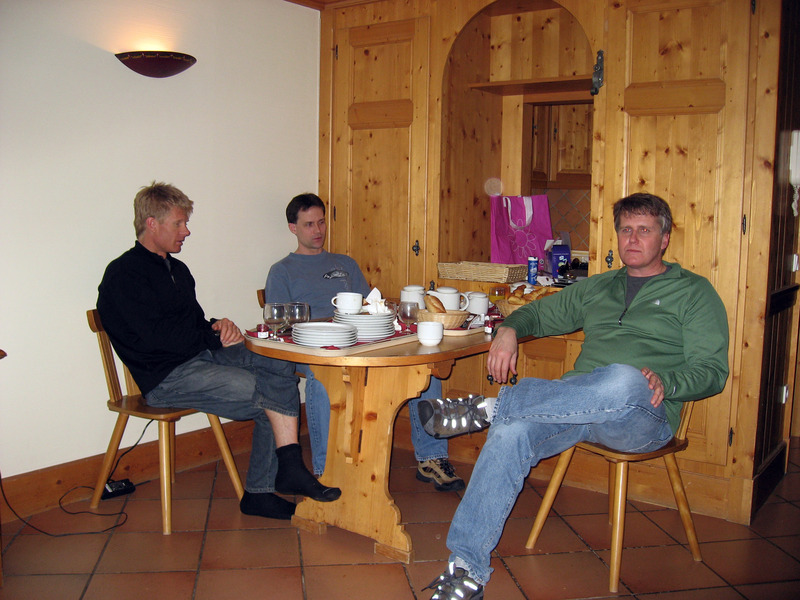 Gary Bigham (on the right) is an old friend of Lance's who has lived in Chamonix for many years. 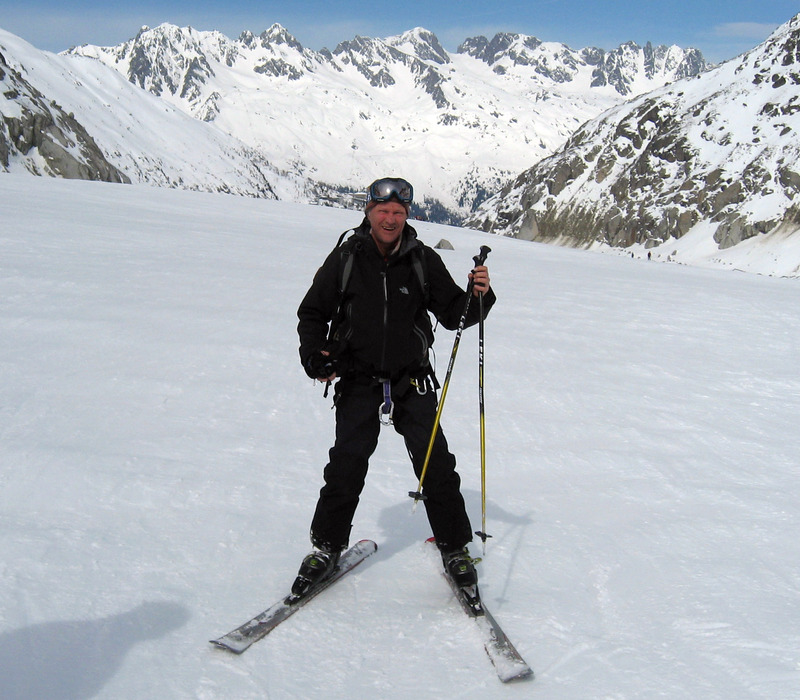 Gary is going to ski with us, to show us the safest paths down Vallee Blanche today. He brought Sara (on the left in red) along to help us out. 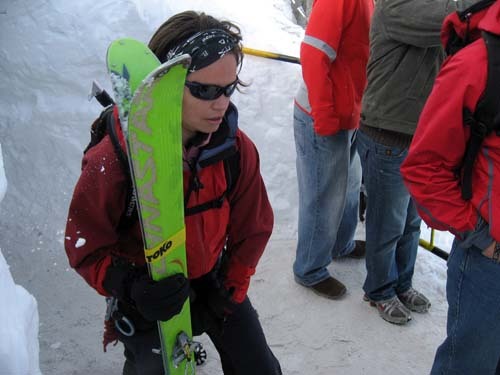 Sara skied "sweeper", she always skied very last in our line of skiers, and she had rope, harnesses, and carabiners along so that if somebody fell in a crevasse she could lower a rope and pull them out. Our tram arrives. This is the "Aiguille Du Midi" in Chamonix, France. 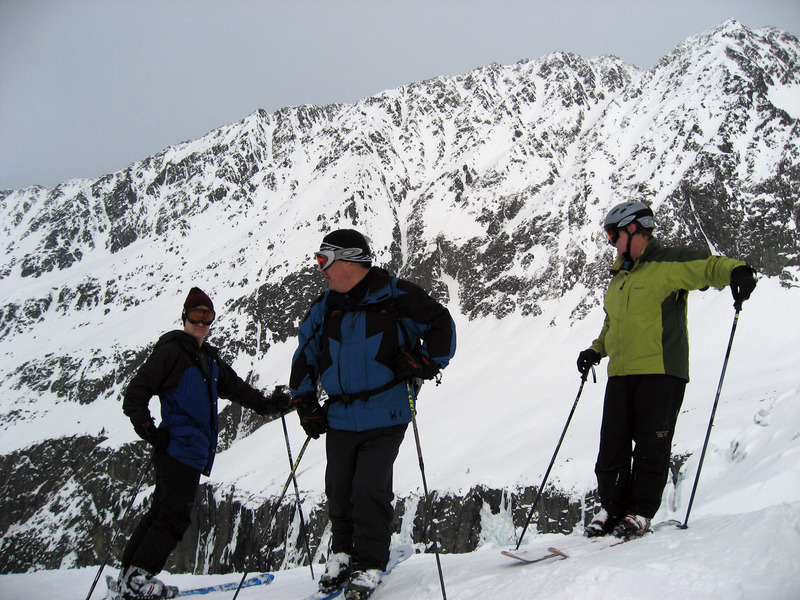 When we arrived at the top, we had to strap our skis to our backs and hike down the ridge. I couldn't take a picture during that because it would have meant letting loose of the rope. 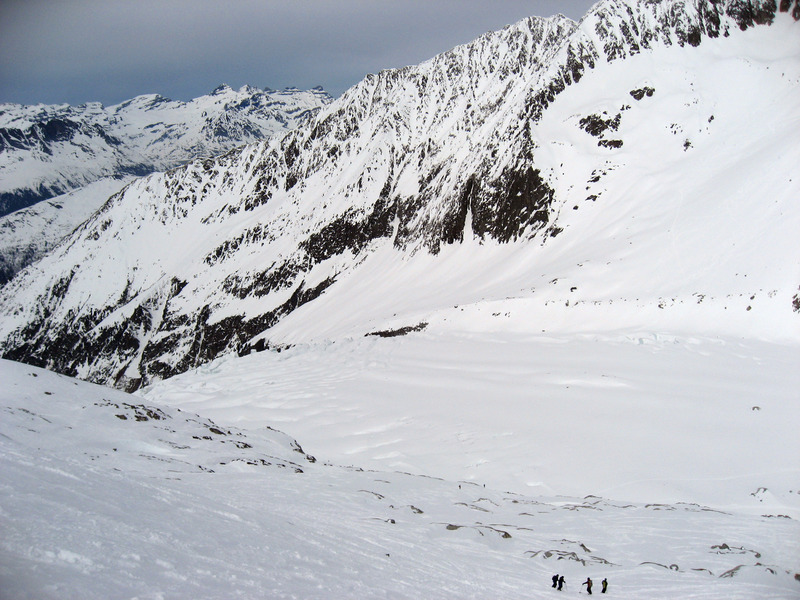 Here I am at the bottom, and I can turn around and take a picture of what we just hiked down. That's Brady closest to me, and Lise in blue a little higher up. 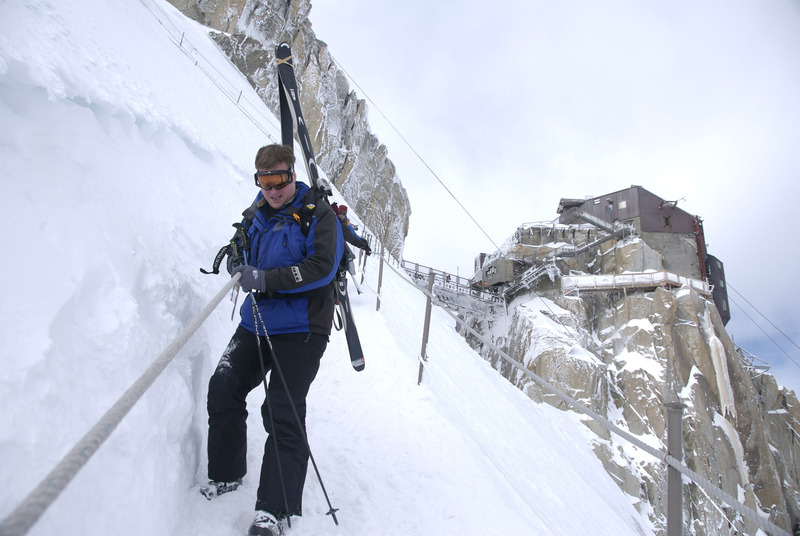 The following photo taken by Gary Bigham is of me (Brian) climbing down the ridge hike at Vallee Blanche, France. This picture by Randall looking back up at Nick and Garth behind him. The picture below is a scanned in postcard. What we just walked down is the "Ridge Hike" marked in red below. 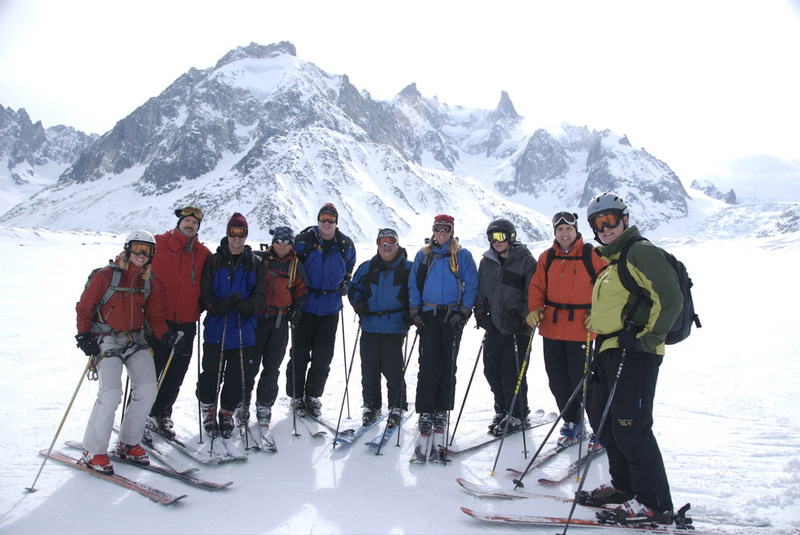 Another picture of the people all getting ready to ski Vallee Blanche and hiking down the ridge. Garth, waiting at the top for the rest of everybody to get ready. 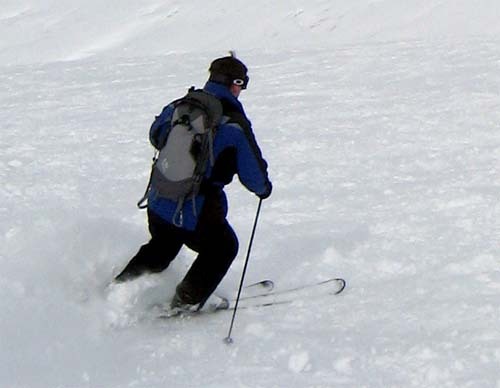 The picture below is after a few minutes of skiing. 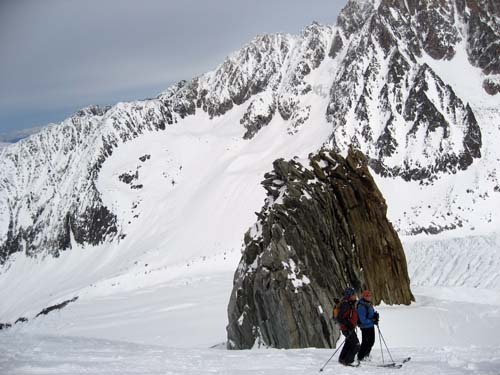 The Vallee Blanche takes about 90 minutes to ski if you don't stop, and are an advanced skier. Same as above, but a panorama so you can see a little of the Vallee Blanche dropping off the right and down below us. Sara (pictured below) is skiing last after all of us. She is wearing a harness and is carrying rope in case somebody falls in a crevasse and needs to be pulled out. 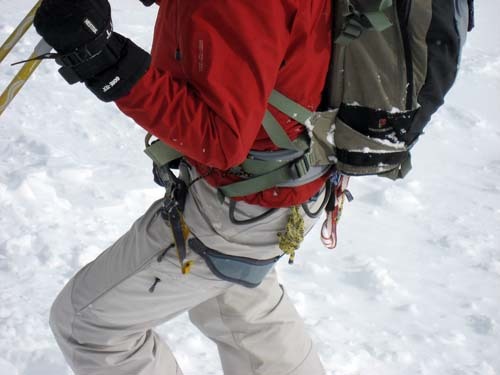 A quick close up of Sara's harness with some carabiners showing. We skied a path that was an intermediate level ski slope, but within a few yards on either side were some beautiful (and completely deadly) cracked ice flows like the one pictured here. Click on the picture to see a much larger version. 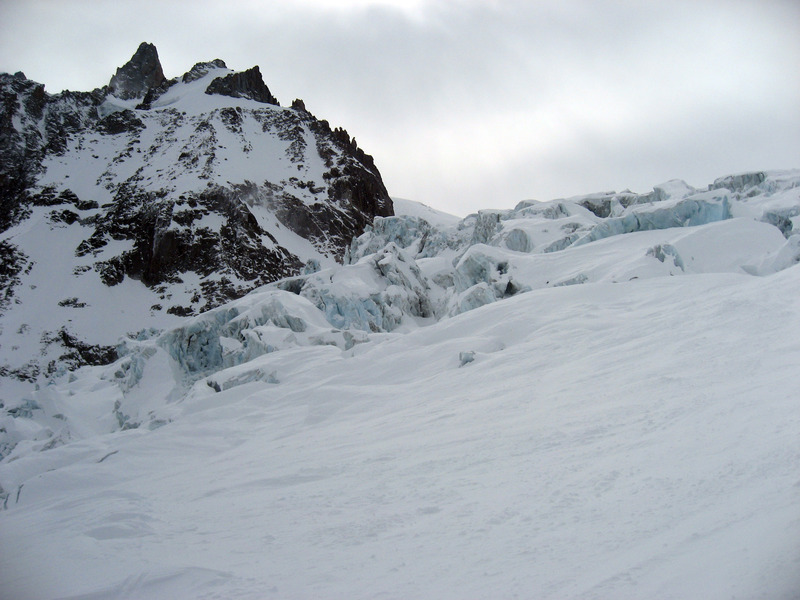 Sara (in red), Lise on the far right in blue, and a beautiful Vallee Blanche stretching out in front of us. 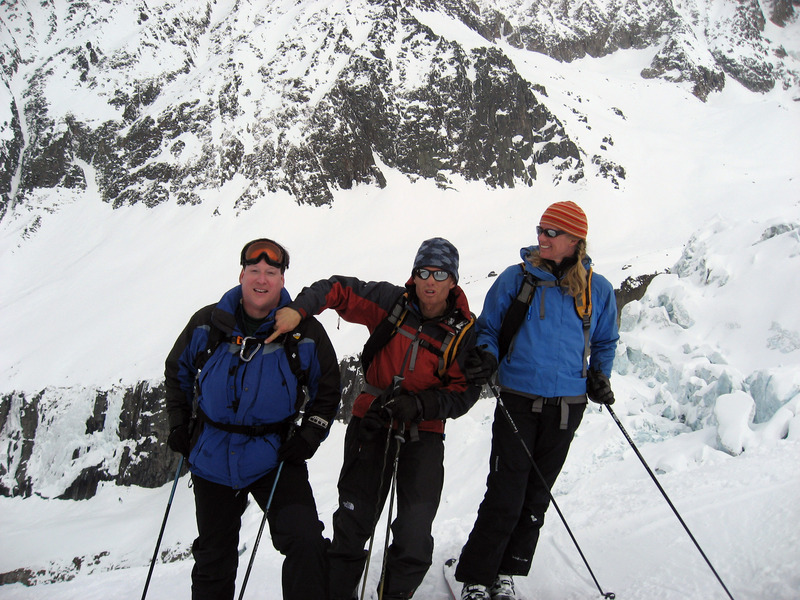 This picture by Randall, that's Brady on the left, Lise in blue in the middle, and me (Brian) on the right. Further along the terrain flattens out a little into the "Mer de Glace" (sea of ice). 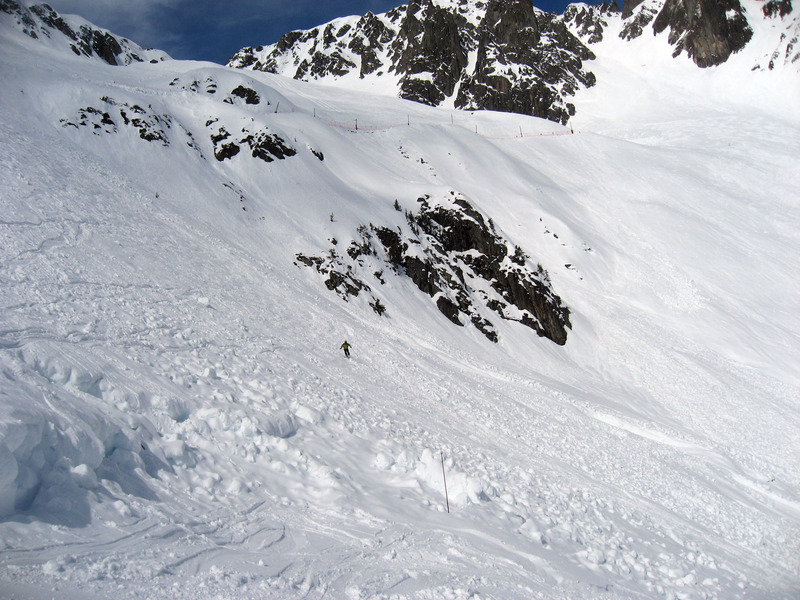 Below is a picture I took while skiing along, this is a pretty easy section. 1. On a Macintosh running the Safari browser, use <CNTRL><CLICK>, then choose the "Download Linked File" option. The resulting file will probably have a ".txt" at the very end of it. Rename the file to NOT have the ".txt" (it should end in ".mp4"). Double click the result, it will play. 2. On Windows XP running Internet Explorer, right click the picture below and do "Save Target As...." and name the resulting file "something.mp4". 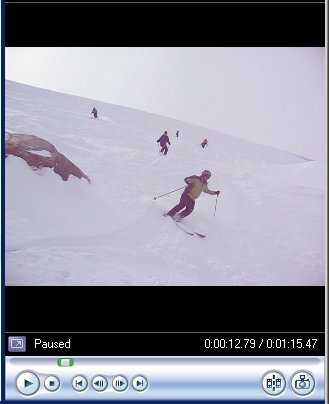 Then run "Windows Media Player" which is available on all Windows computers, and drag and drop the movie onto the MediaPlayer and it will play just fine. 3. On Windows Vista -> YOU CANNOT PLAY .MP4!!! 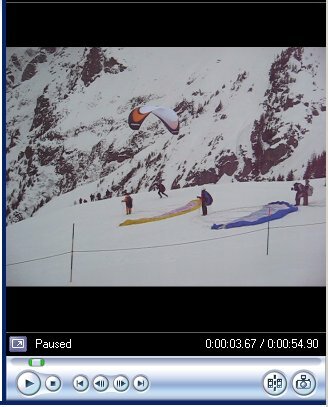 Microsoft has decided to fight the ".mp4" format and not allow anybody using Vista to play it. Microsoft added a lot of code to Media Player to disable this functionality. Microsoft put 10,000 programmers on Vista for 5 years in order to completely disable the functionality that used to work fine (yes, I'm bitter :-). Do NOT attempt to play this video on Vista (do *NOT* install any 3rd party codecs on Vista, all 3rd party codecs are untrustworthy, and are riddled with spyware and viruses). (SEE NOTE ABOVE PLAYER on how to get it to play!! NO ADDITIONAL SOFTWARE IS NEEDED!!) If you have a Windows computer, you can also download the above movie in Windows Media Format (WMV) by clicking here then unzipping and playing it. If you REALLY have problems, here is a link to a lower quality YouTube Flash version. Below is a picture of what we just skied (looking backwards). Below is a picture of Gary Bigham. 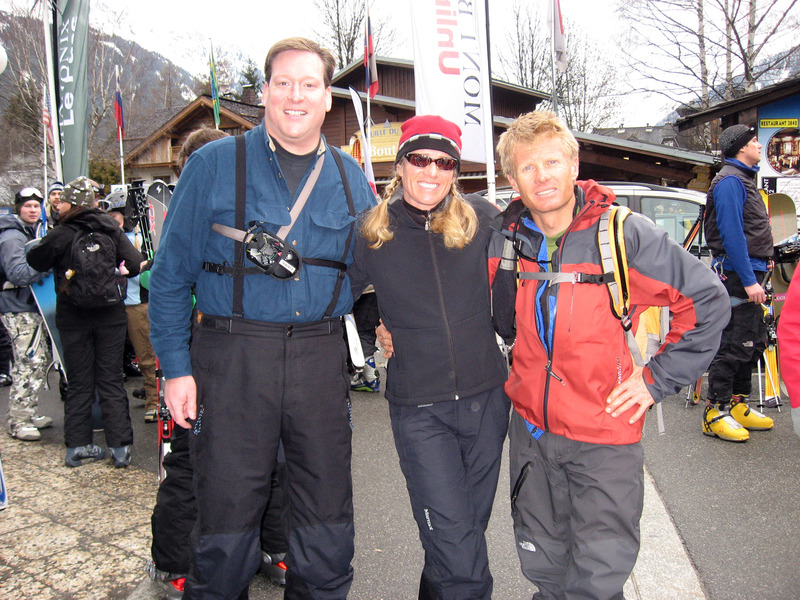 Gary has lived in Chamonix for many years so was a good guy to have along with us. Since there isn't much snow this year, we can't ski all the way back into the town of Chamonix. The "bail out point" is here, where we walk up those stairs and then take a cog train called "Montenvers" back down to town. 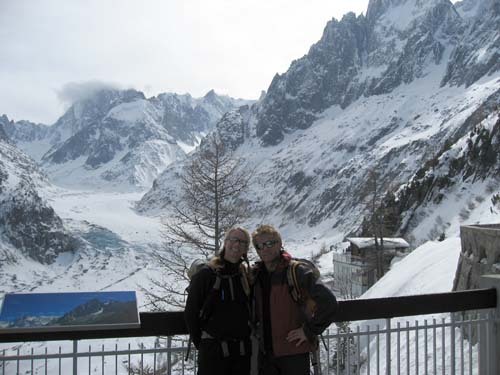 Lise and Brian (me) at the top of the stairs, waiting for the Montenvers cog train at the end of Vallee Blanche outside of Chamonix, France. Another Lise and Brian, while waiting for the Montenvers cog train for a ride back into town. 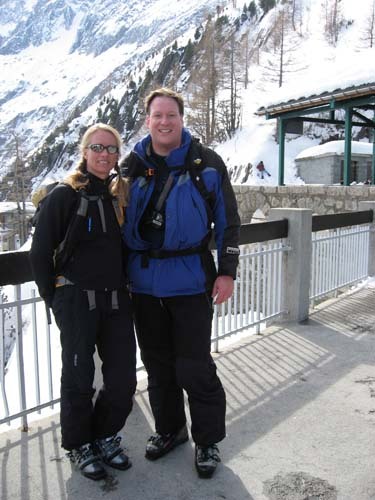 Lise and her brother Lance. That's the Vallee Blanche we just skied behind them. Below is a picture I took THE FOLLOWING DAY of this location from across the valley. We skied down from the very upper right corner of the picture in the Vallee Blanche, then got a ride on the Montenvers Cog Train down the railroad into the town of Chamonix. 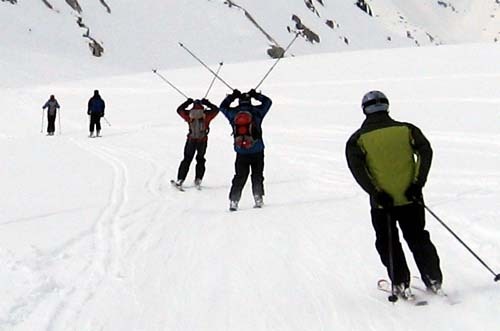 If there is more snow, you can ski all the way down into town. 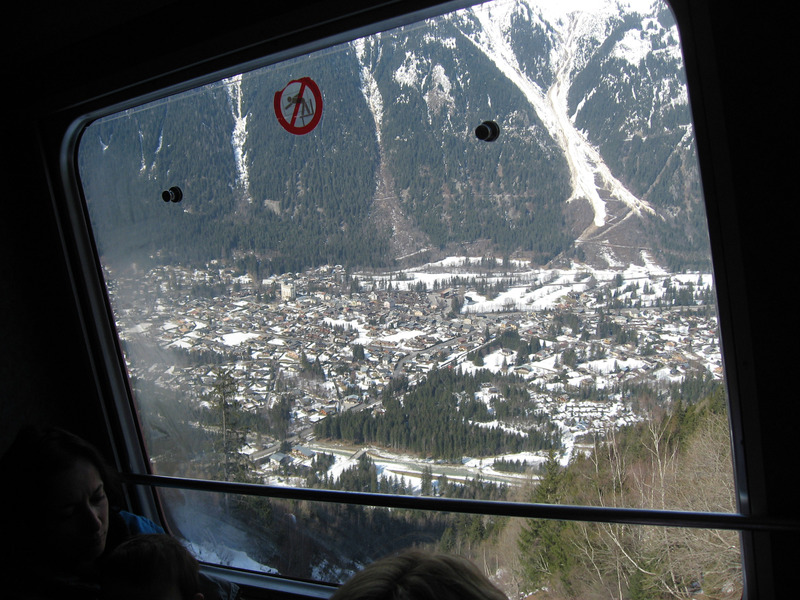 A picture out the window as we ride the Montenvers cog train down into the town of Chamonix, France. Here we are relaxing and having lunch after skiing Vallee Blanche, near Chamonix France. 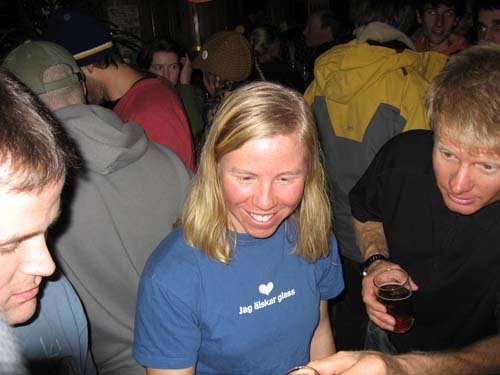 Later that night we met back up with Sara (center below) at MBC and Click Here for English Version of MBC (a local apr�s-ski micro brewery to have a drink and some food). "MBC" stands for "Micro Brasserie de Chamonix" and it is located at 350 route de bouchet in Chamonix, France. Gary Bigham (who skied with us during the day) is a singer in a band that was playing this night at the MBC. 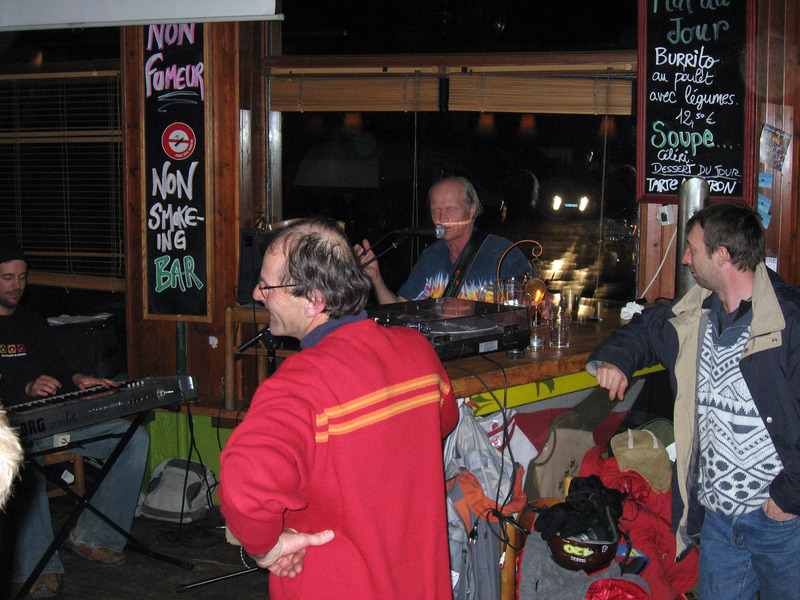 Gary's band is called "The Crevasse Holes". 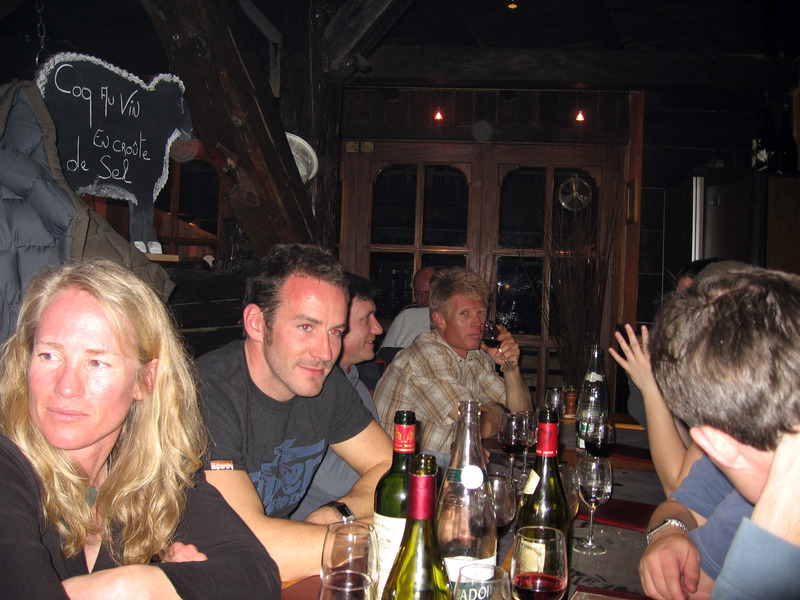 In addition to his singing, Gary runs a little Chalet called "Vitamin Ski Holidays" and a photography business. 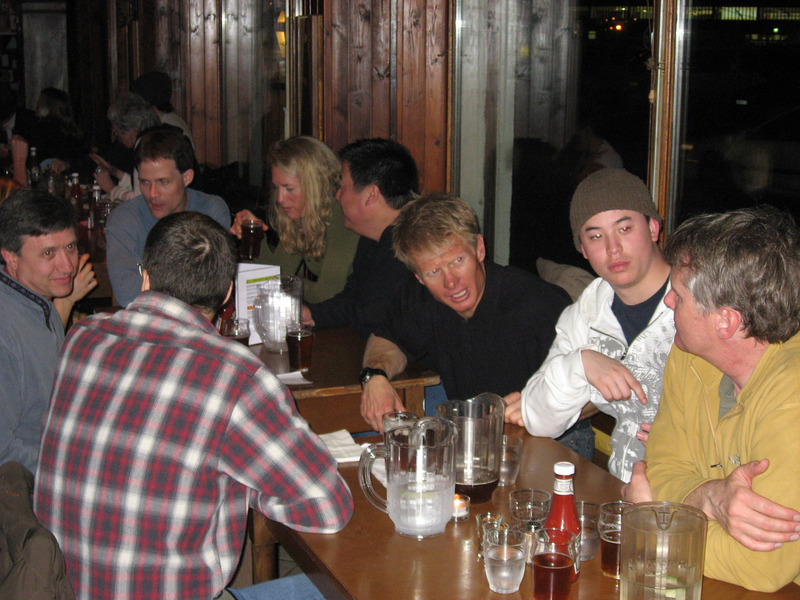 Our table at MBC, discussing the day of skiing. Another picture of our table. On 3/7/07 (Wednesday) the day after Vallee Blanche, then we skied the ski area of "Le Brevent" which is interlinked to a ski area called "La Flegere" by a short horizontal tram ride. 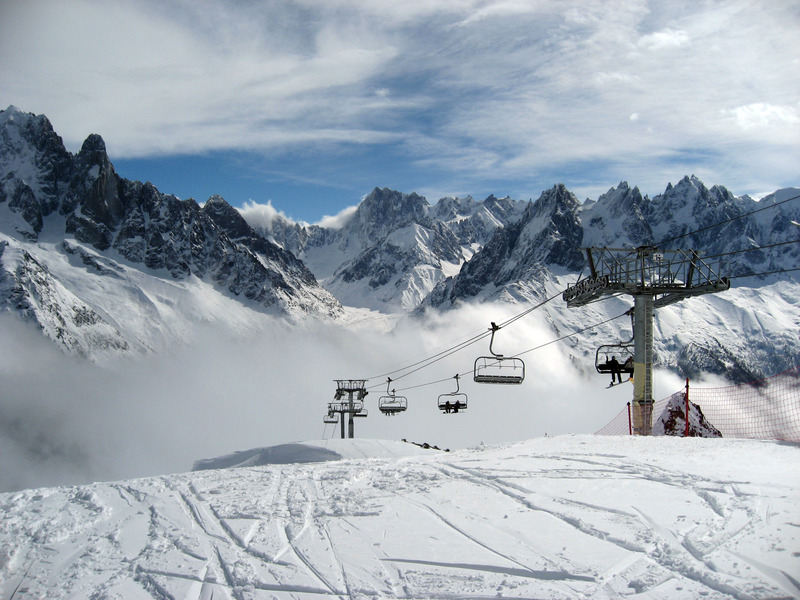 Essentially these two ski areas are one big ski area in Chamonix, France. 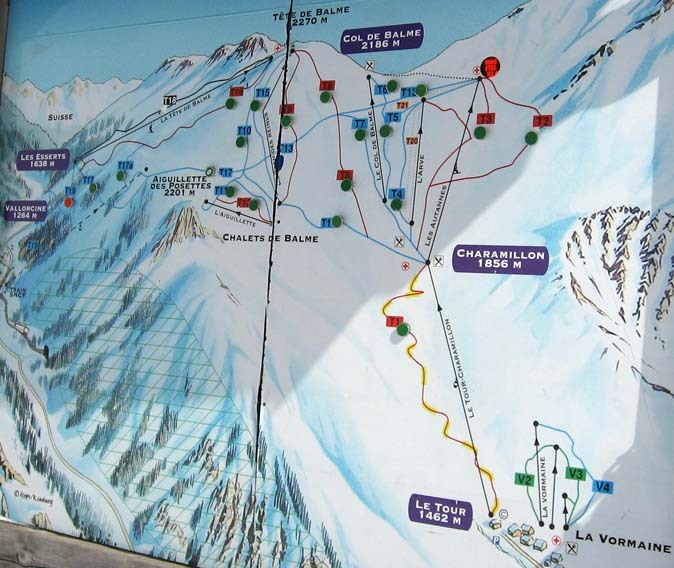 Below is a lift map of the two ski areas, our hotel (called "Les Balcons Du Savoy") is located in the lower left of this picture right at the bottom of the gondola that is the very VERY lower left of the picture. Click on the map below to get a zoomed in version. 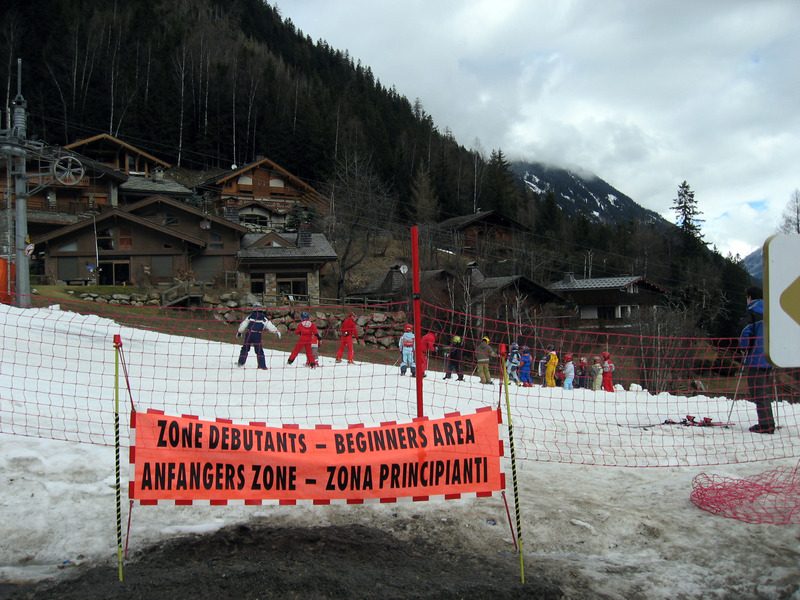 As we walk to the lift from our hotel, I took this picture of the French sign saying "Zone Debutants" which seems to mean "Beginner's Area". From left to right on the Le Brevent ski area, that is Paul, Brady, Garth, and Randall. If you look across the valley to the other side, you can see Vallee Blanche above Chamonix, France. 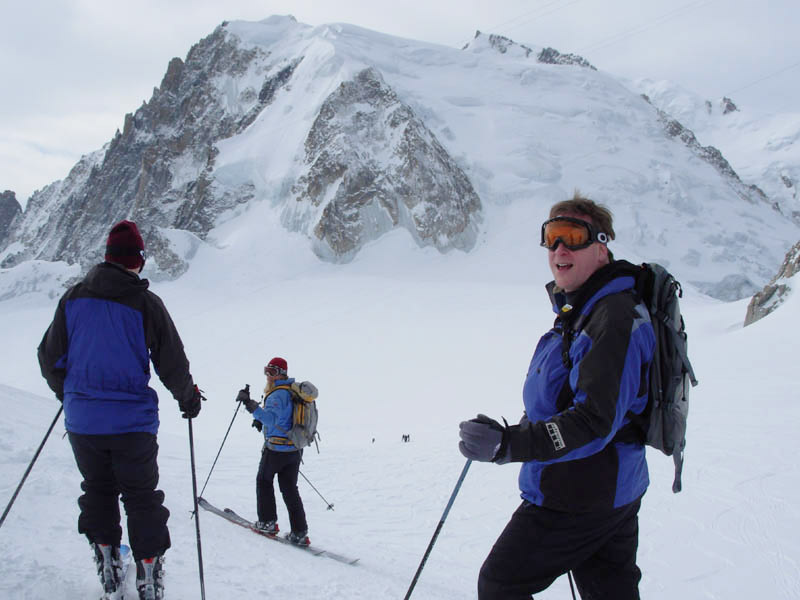 We skied the Vallee Blanche the day before. 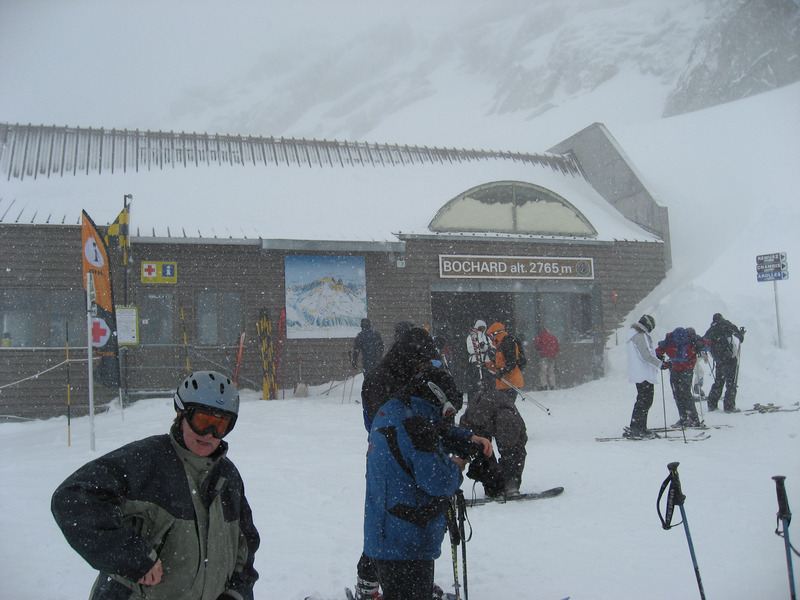 When I took the picture below, I was standing in the ski area of "Le Brevent" above Chamonix, France. Same view, slightly further along. 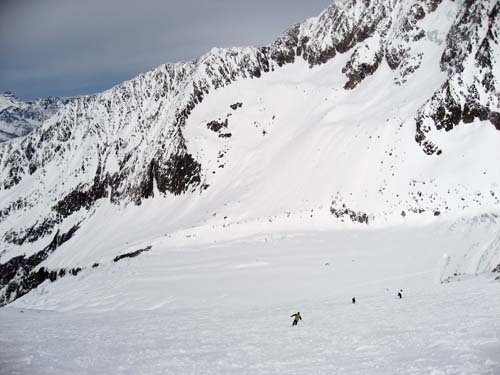 That spec in the middle of that huge slope is Paul Wieneke. Click on the picture to zoom in and see his face. 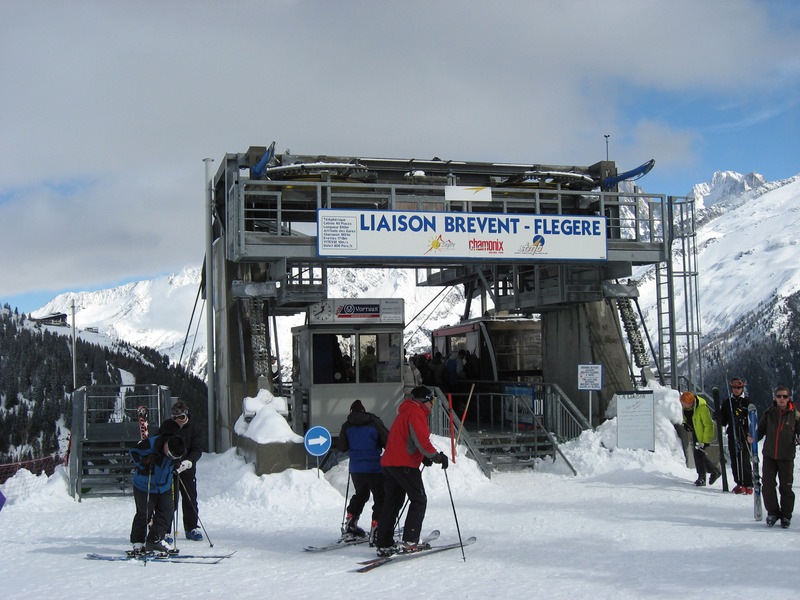 This is the "Liaison Brevent - Flegere" (horizontal tram between the two ski areas). 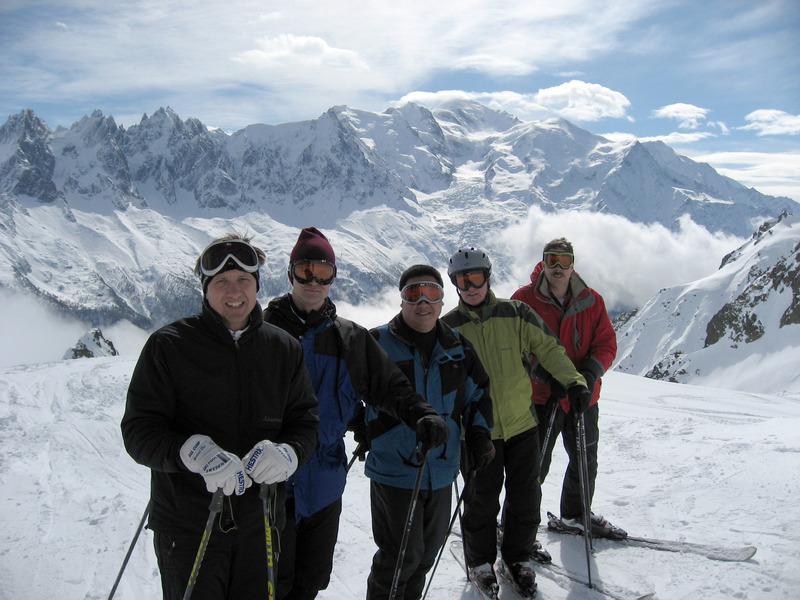 Garth, Brady, Mike, Paul, Randall with the beautiful mountains of Chamonix, France behind them. Below is a panorama of the mountains surrounding the town of Chamonix, France. 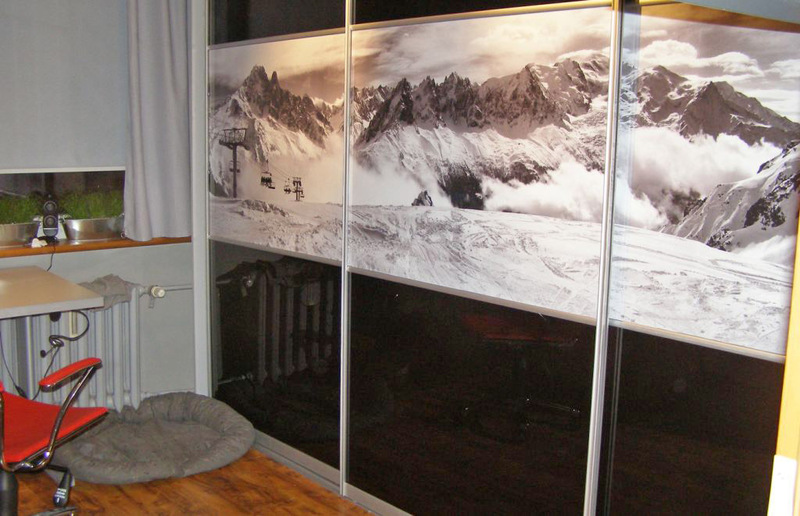 The following picture is the same as the one above, but hanging in Łukasz Tomanek's apartment in Poland. Łukasz sent this to me to show me, I think it's fabulous! 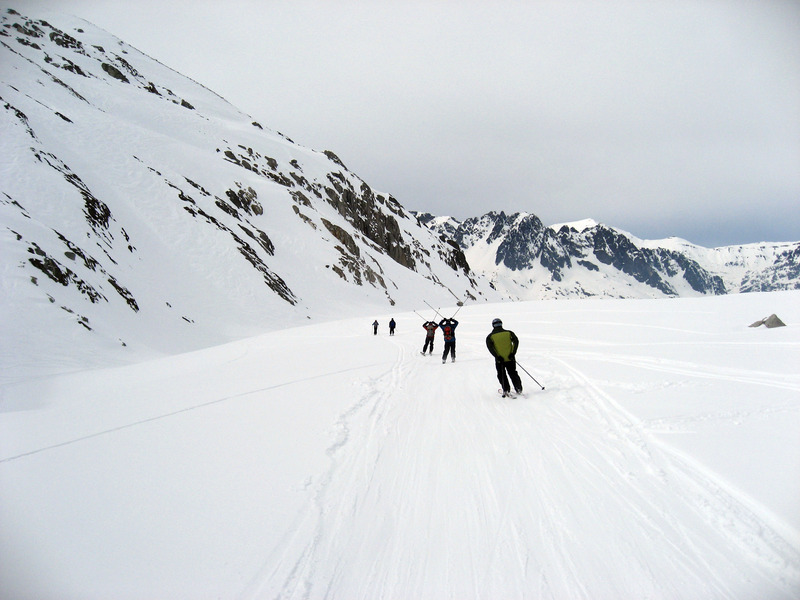 Notice two skiers were removed from the picture to make it a little more about nature, which I think is and improvement. 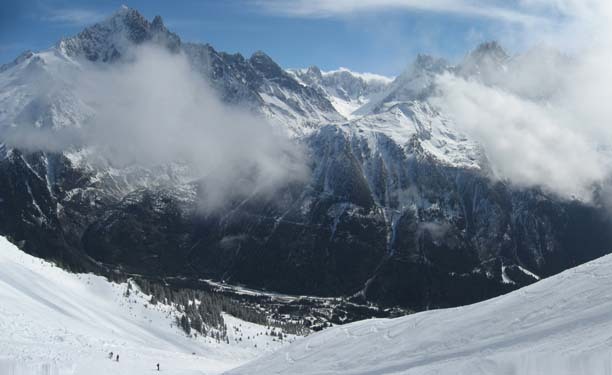 Off in the distance across the valley, the Vallee Blanche is hidden in low clouds. A random panorama taken while riding the chair lift above Chamonix, France. 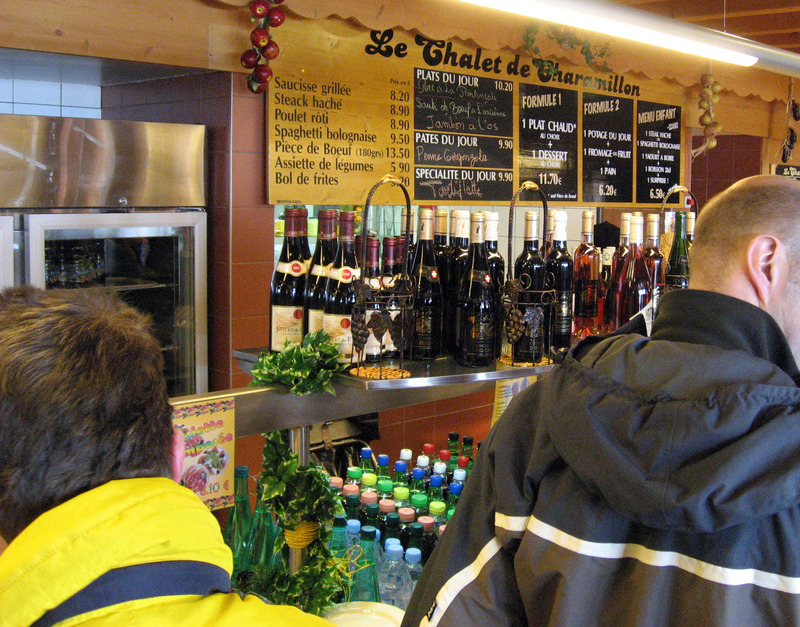 On the slope of "La Flegere", we stopped for lunch. 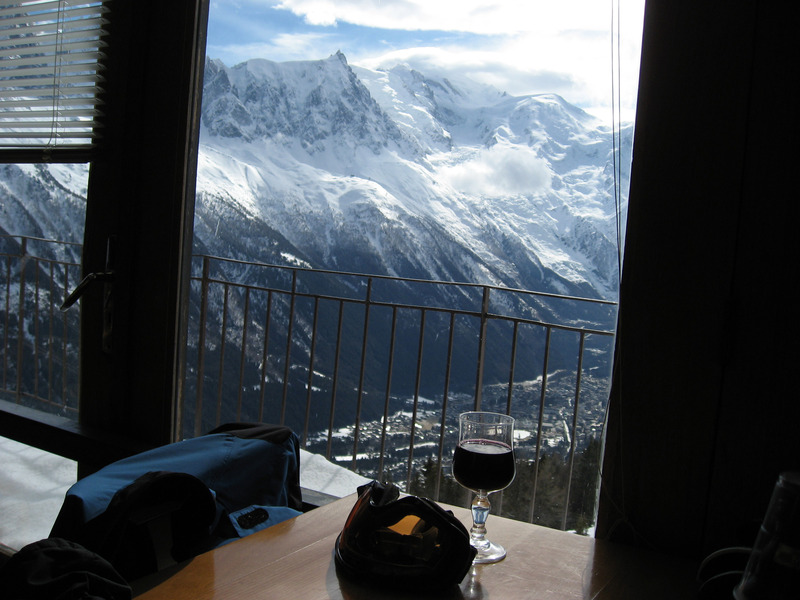 I took this picture of my red wine glass in front of the window overlooking the town of Chamonix. 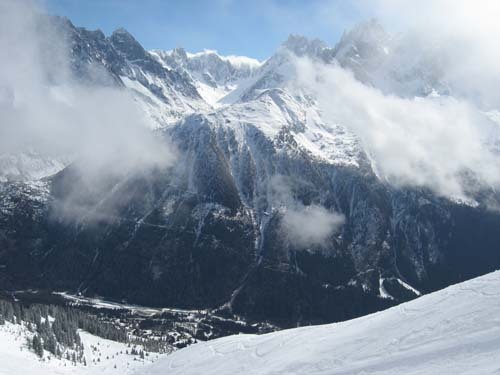 It is very, VERY pretty here in Chamonix, France. Same view, just leaning closer to the window where we ate lunch. 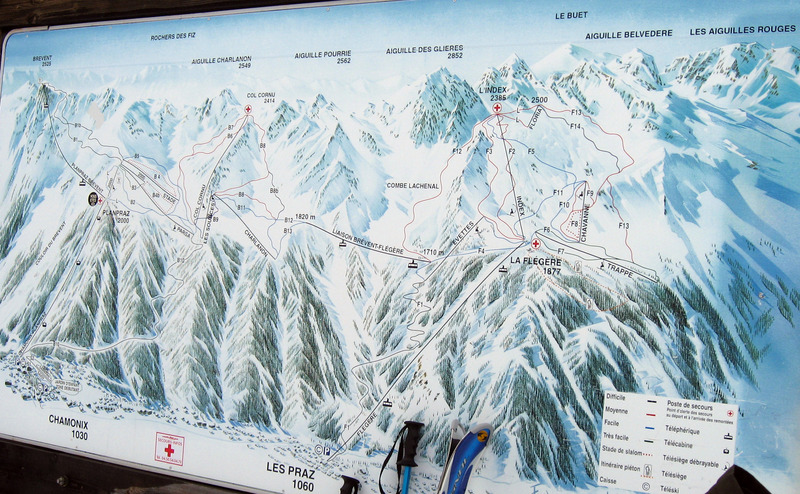 A quick picture of a sign showing a map of the whole valley that surrounds the town of Chamonix, France. Click on the picture below to see a more detailed version that is more readable. At the end of the day, we stopped and watched these paragliders take off and fly down into the town of Chamonix, France. A slightly wider view before takeoff. At the end of the day we downloaded on the gondola, here is Brady 7,000 feet above the valley floor looking out the window of the Gondola on the slope of Le Brevent in Chamonix, France. 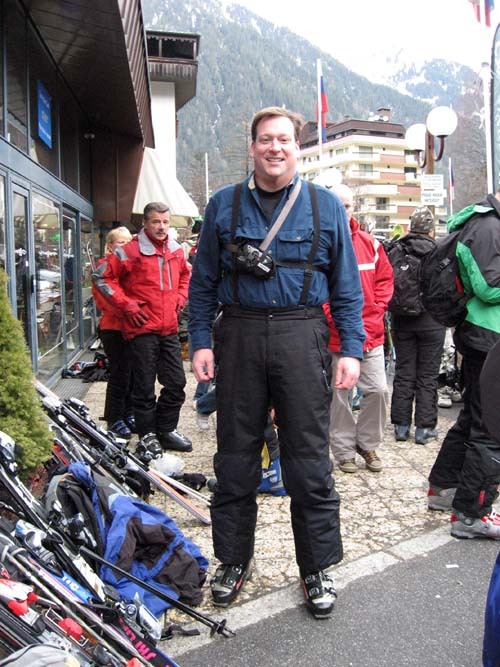 On 3/8/07 (Thursday) we took a break from skiing (although Paul went up skiing alone). 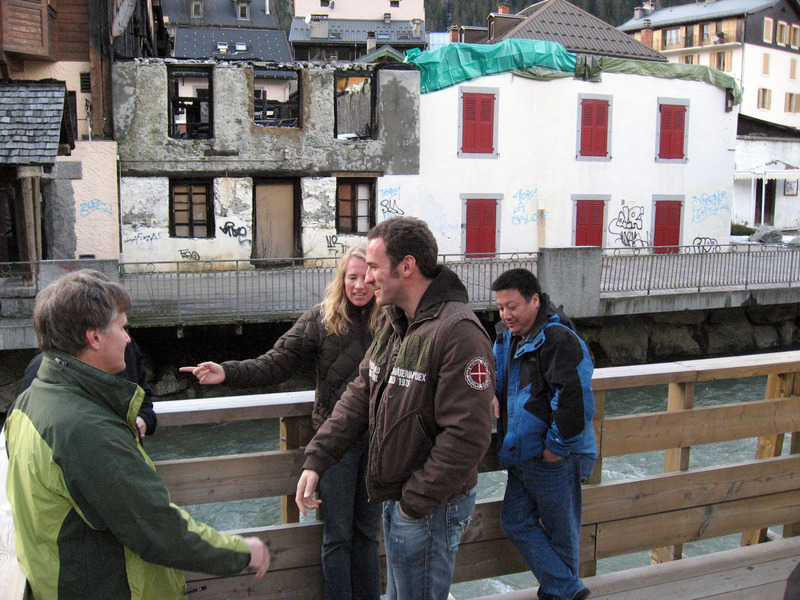 Most of us went shopping and wandering around town. 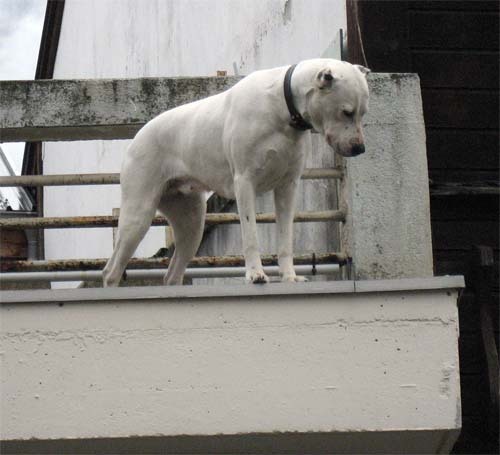 I saw this dog standing outside the balcony on the second floor. 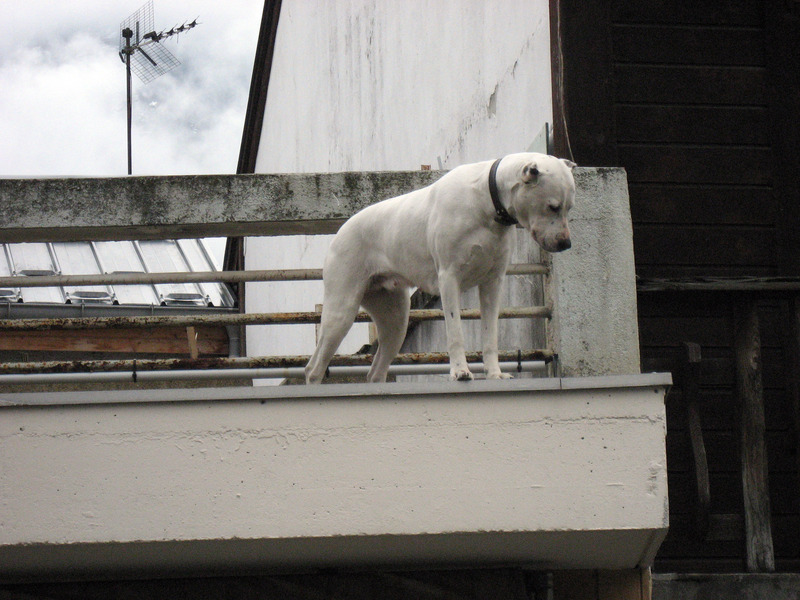 A close up picture of the dog standing precariously close the edge. 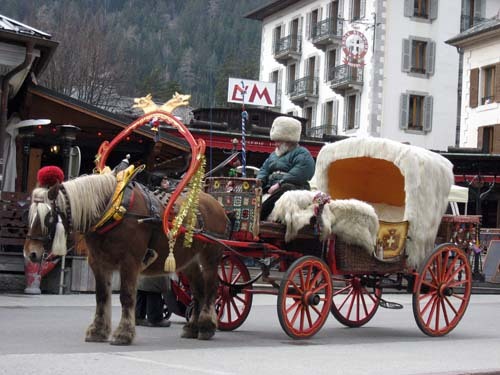 We had coffee across the street from this guy who drives a horse drawn carriage that tourists can hire to stroll around in Chamonix, France. 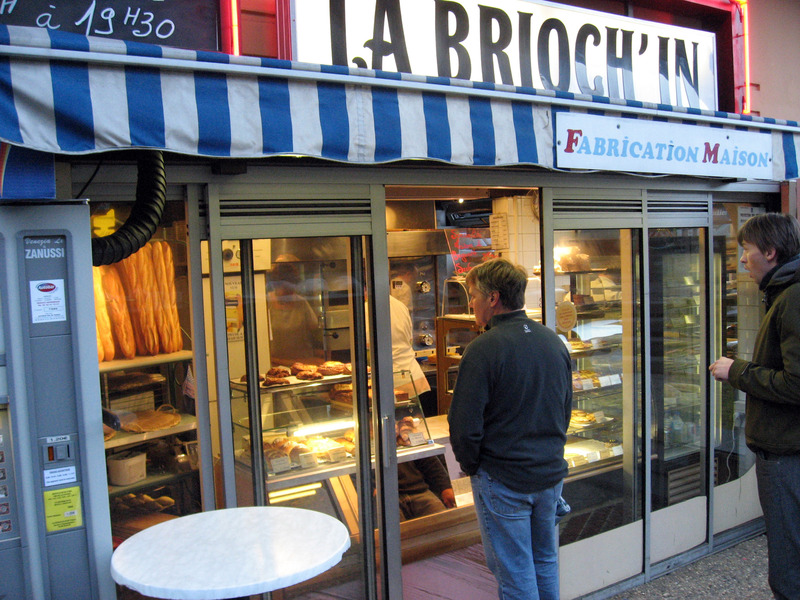 That night we got some French bread, some wine, some cheese, some meat, and had a simple yet delicious meal. It was Lise's birthday. Later down in the hotel's game room, that is Nick on the left driving against Lance on the right as the rest of us watch. 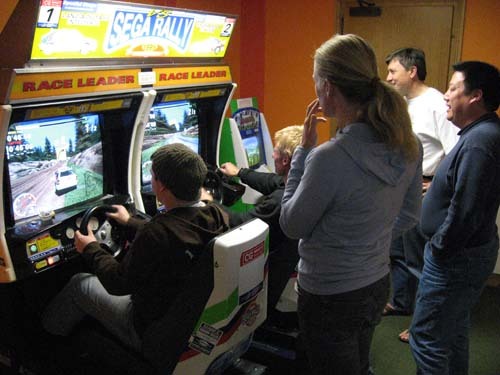 Lance and Nice racing each other. 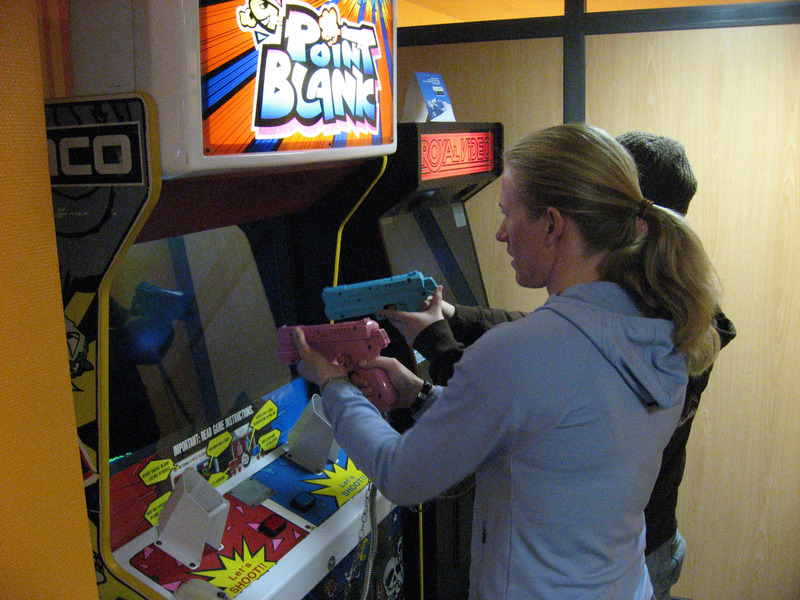 Lise and Nice blazing away with guns at this video game. 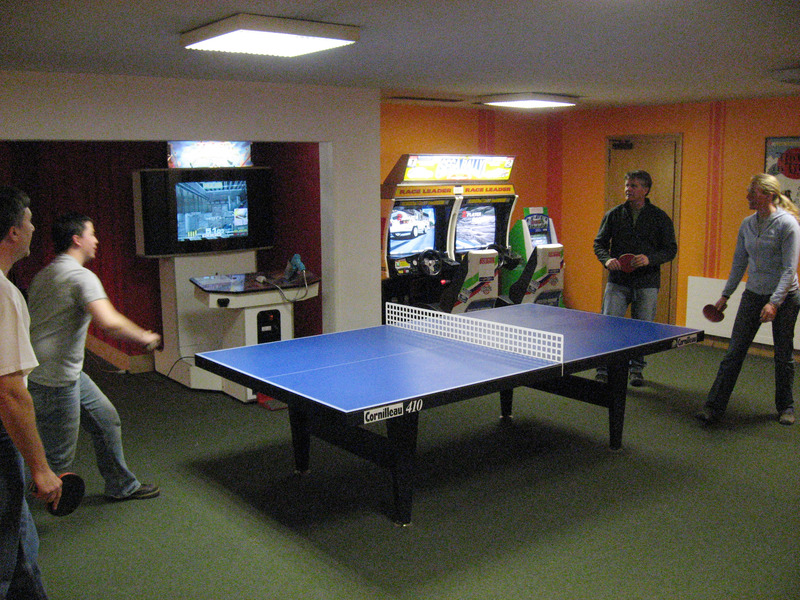 Paul and Lise vs. Nick and Garth playing ping pong. 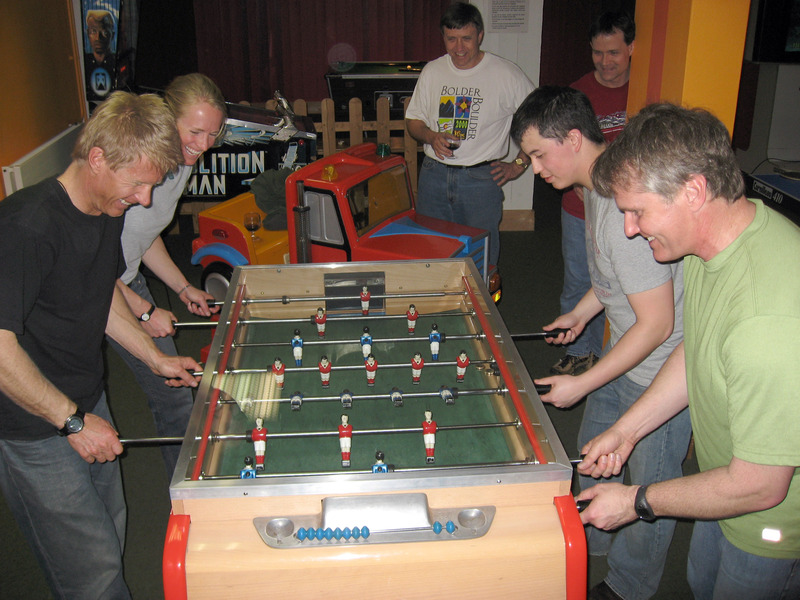 Brother and sister (Lance and Lise) against Nick and Paul in a serious foosball game. On 3/9/07 (Friday) we strapped on the avalanche beacons, grabbed our shovels, bolted on some carabiners, and headed for the second off-piste assault of the trip. I took the picture below from my hotel room balcony with a tripod early in the morning. I can't capture how amazingly pretty it is, but you kind of see the light breaking over the mountains. Paul and I made our morning run for fresh hot bakery supplies for breakfast. At the ski area, waiting in line, I took a picture of the lift map sign. 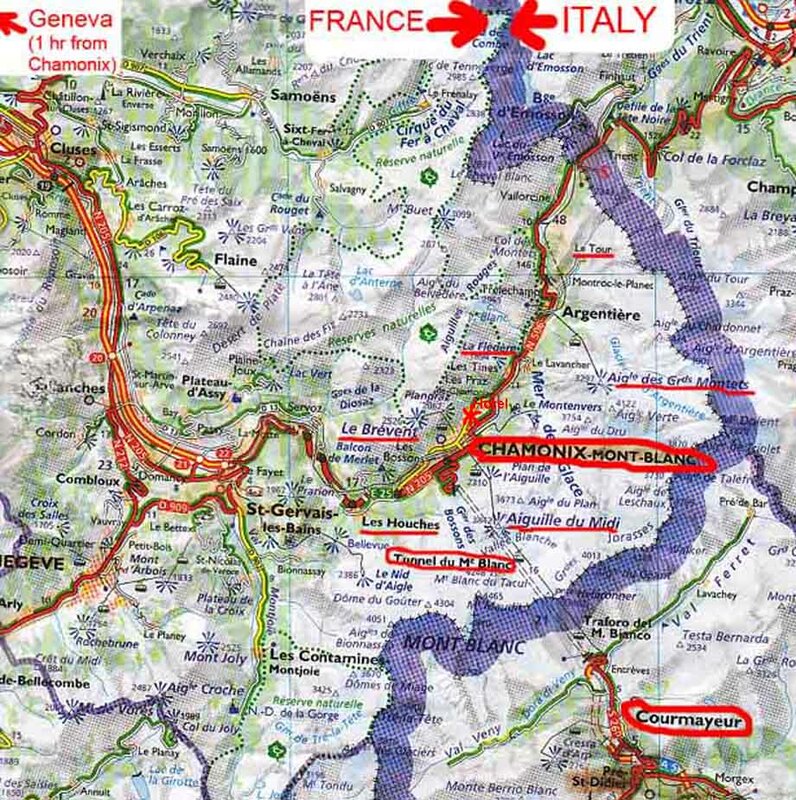 I marked it in red below for the off-piste path we plan to take. We go to the top of the tram at Les Grands Montets, then ski down through the Glacier D'Argentiere then back into the ski area. 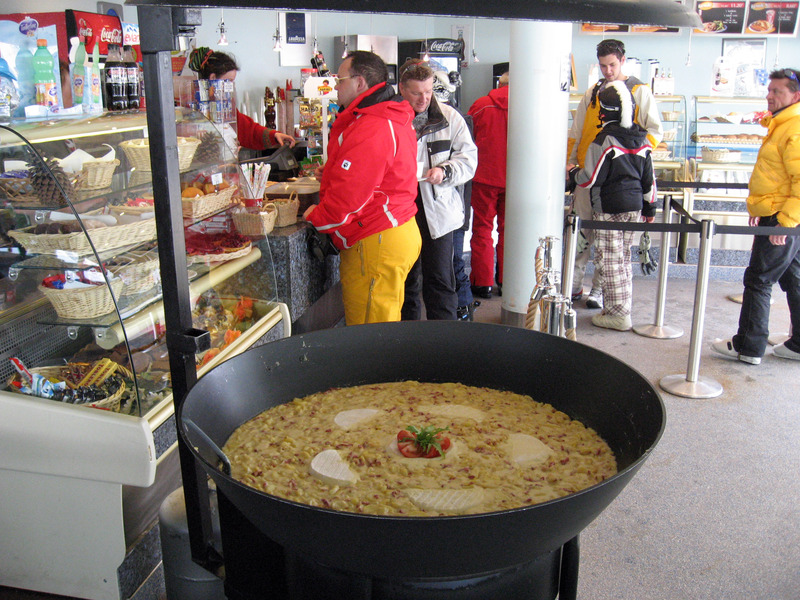 At lunch before we headed out of bounds, I saw this ENORMOUS bowl of cheese, potatoes, and ham in the lunch room. 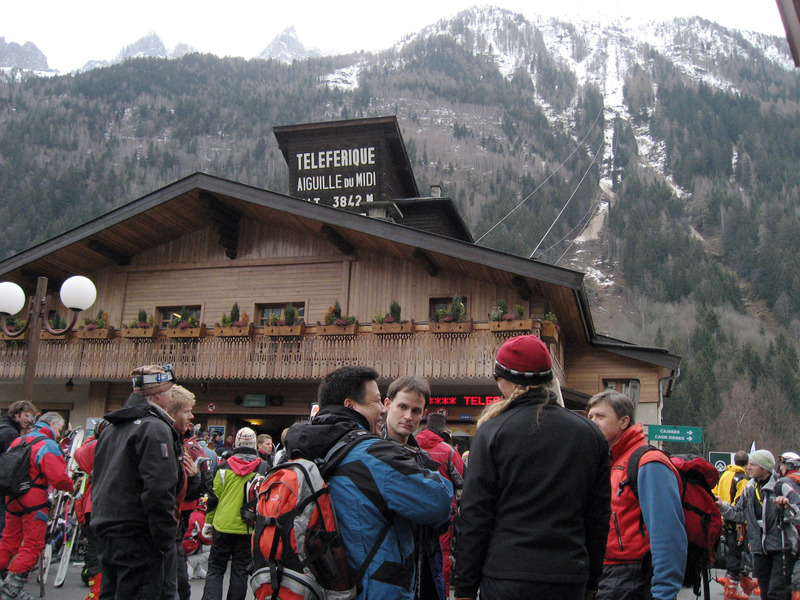 Waiting for the tram to take us to the top of Les Grands Montets. Here is our tram arriving that we will take to the top. While riding the tram, looking down out of the window. Here we are at the top! Garth, Randall, and Nick left the day before, so we are down to (from left to right): Mike, Brady, Lance, Lise, Paul (and myself taking the picture). Finally! 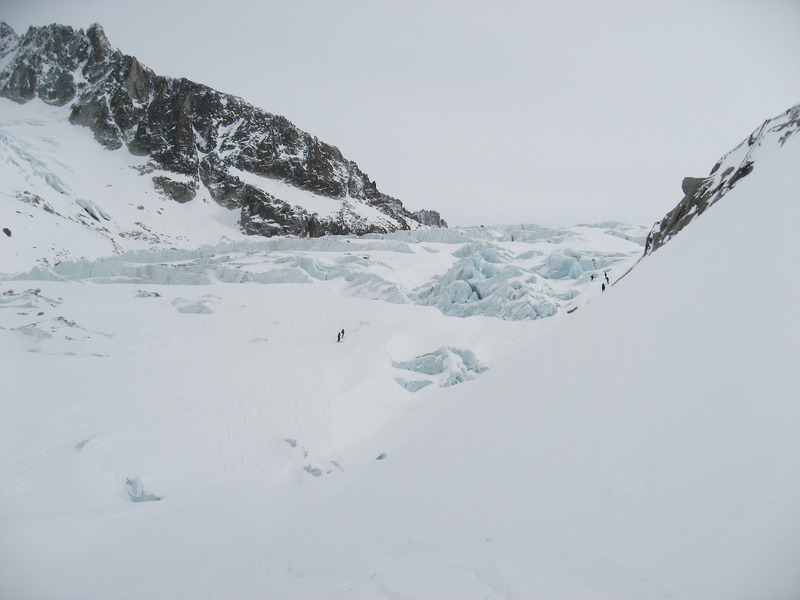 Launching out onto the Glacier d'Argentiere just outside of Chamonix, France. 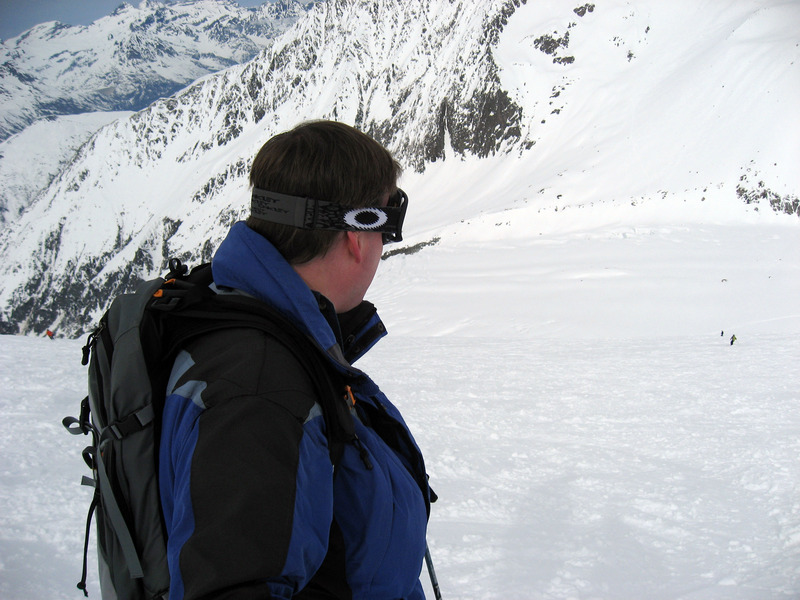 We are all wearing avalanche beacons, and many are carrying shovels and avalanche probes in our backpacks. 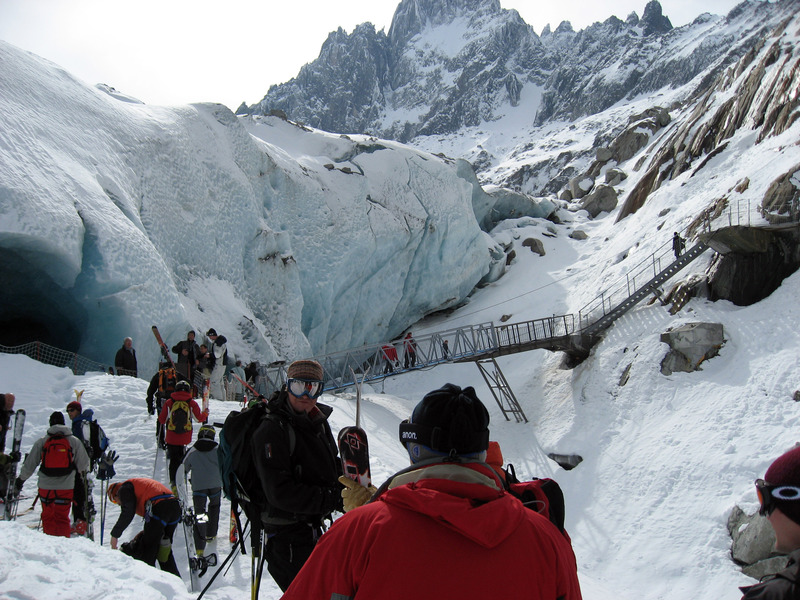 A picture of the very scenic Glacier d'Argentiere near Chamonix, France. 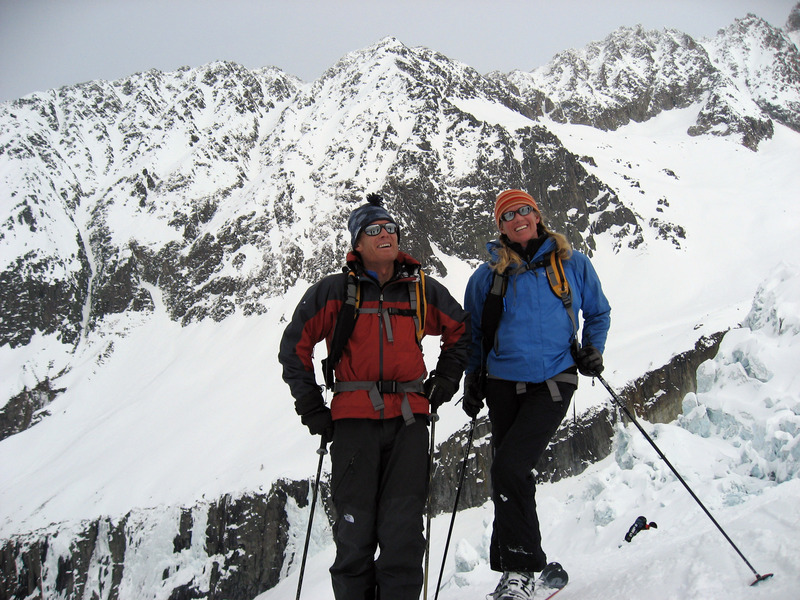 Lise and Lance in front of a big rock, planning our next section of descent. Lance in red next to Lise in blue, then Brady, Mike, and Paul. 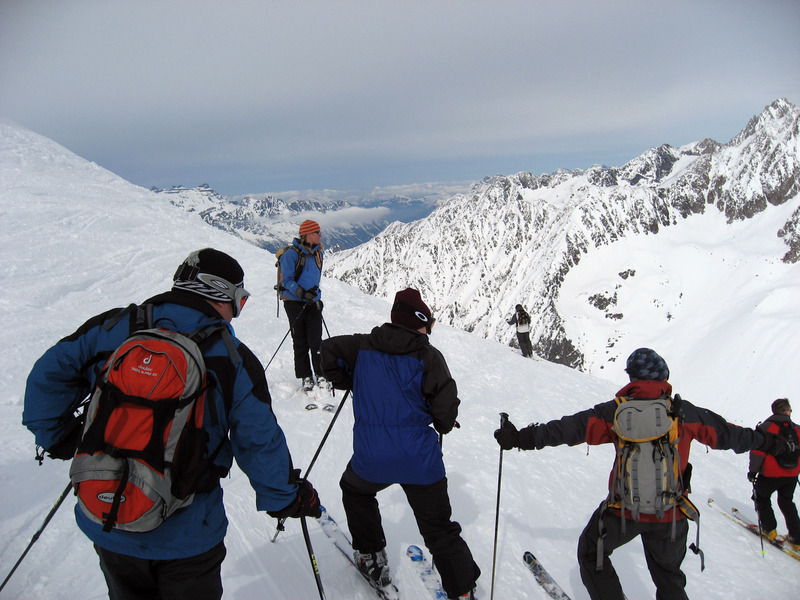 Those are the group in front of me down below (Lise is behind me). 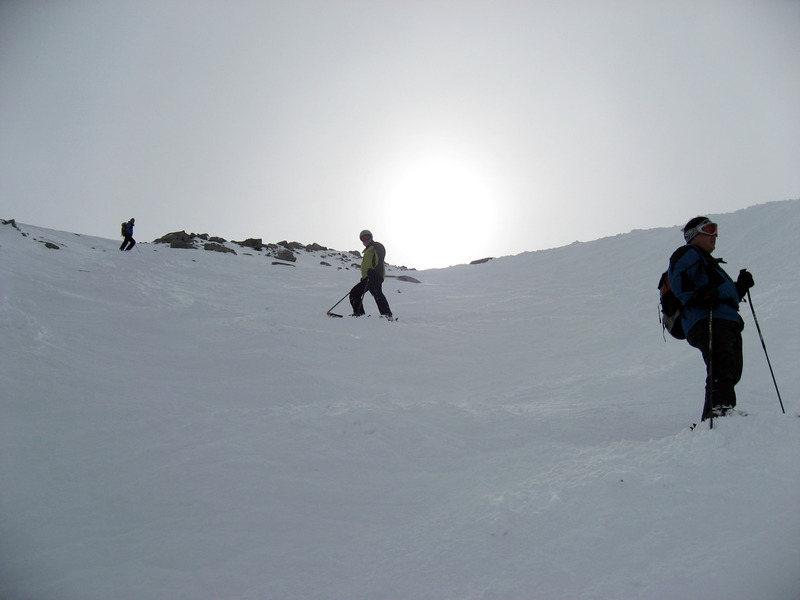 I gave Lise the camera, and she took this picture of me looking down the hill. 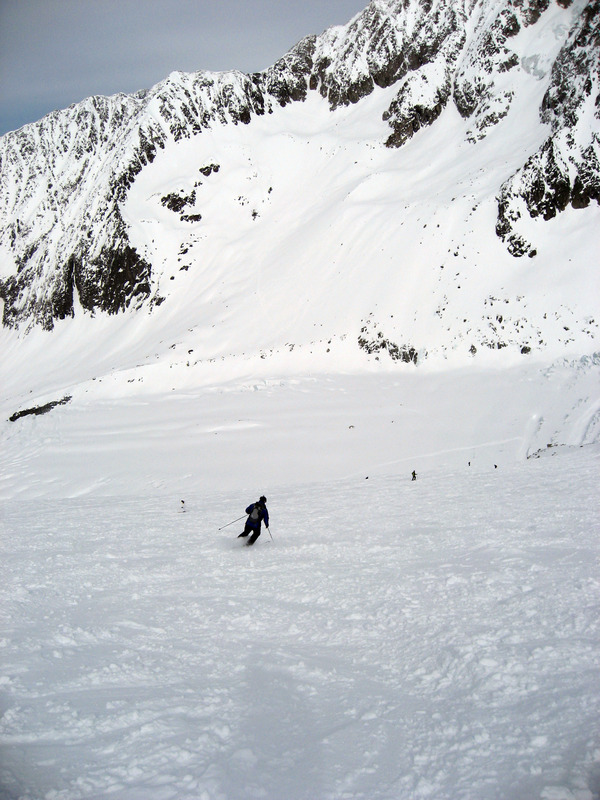 Lise took another picture of me as I drop down further on the slope of Glacier d'Argentiere near Chamonix, France. 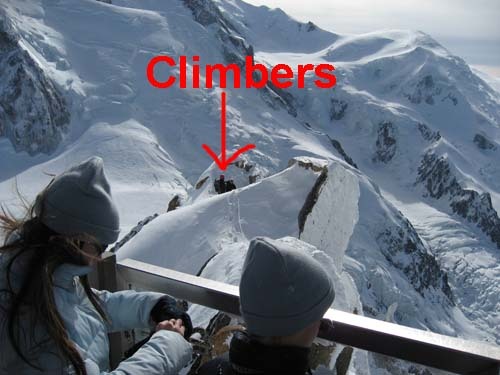 Later on, those are our group WAAAAY down below. 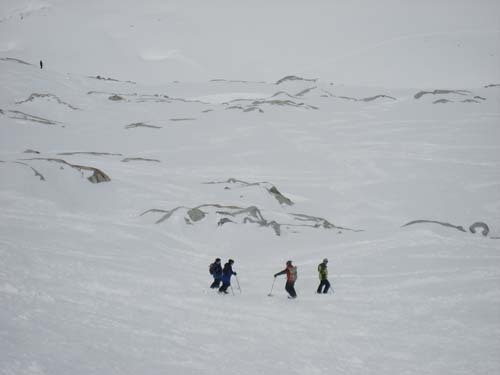 What they are doing is trying to figure out a path down through the rocks and cliffs below that is safe (no big drops, no crevasses, etc). I'm staying back waiting for them to make their decision. We entered this fairly steep chute, and I stopped to take this picture looking up at Lise (far upper left), Paul, and Mike on the right. 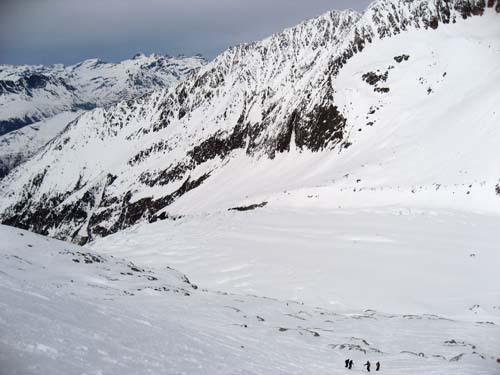 Skiers off in the distance who took a more challenging route through some broken up ice fields. Down in a fairly flat section, Mike and Lance are fooling around being silly while they cruise along. Lise on the left looking for a safe path down. 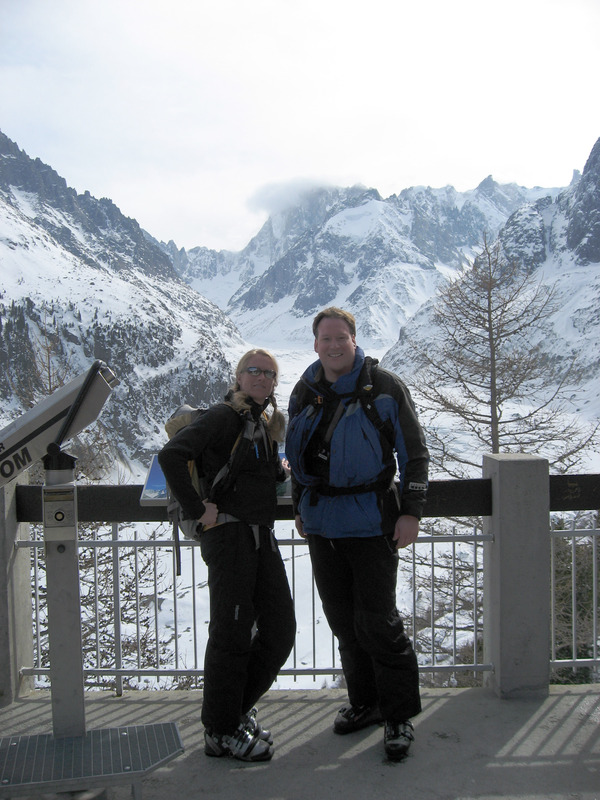 We are on Glacier d'Argentiere near Chamonix, France. The town of Chamonix is down and to the left of this picture. Brady on the left, Mike in the middle, and Paul in yellow on the right. Lance on the left, with sister Lise on the right in blue. 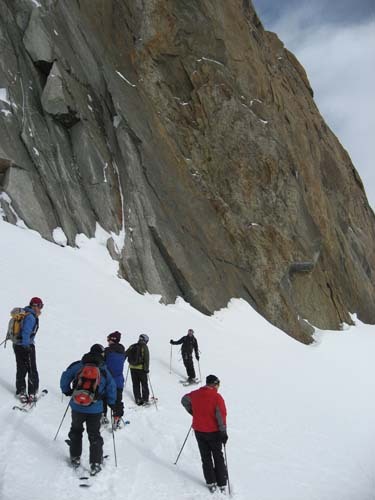 They are on Glacier d'Argentiere near Chamonix, France. That's me (Brian) on the left, and Lance is being silly and pointing at my brand new (very first) carabiner that Mike bought me so I could be "cool" skiing on the mountain. A carabiner is a metal loop with a spring "gate" on it so you can clip ropes in quickly. Lise is laughing at how silly we are being. Finally off the Glacier d'Argentiere, here we are back in the main ski area of Les Grands Montets, near Chamonix France. 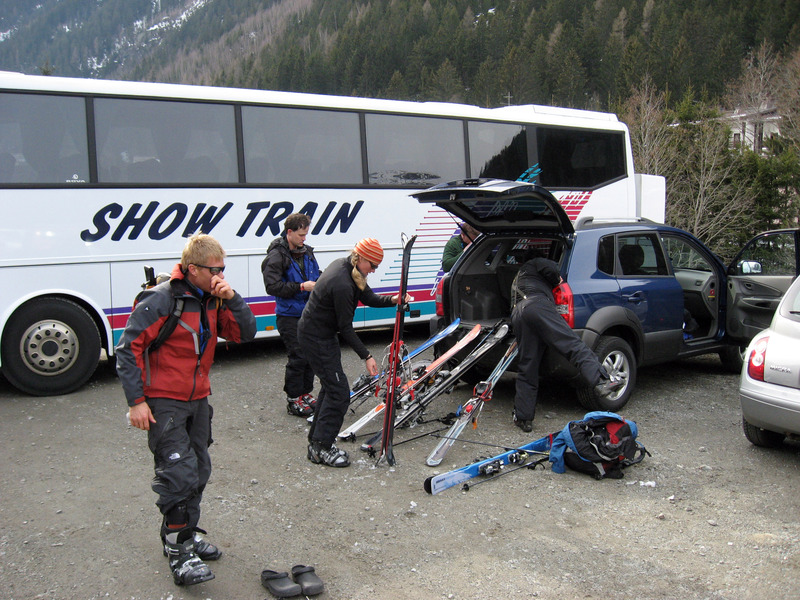 Finally back at the car, safe and sound, packing away our gear. On 3/10/07 (Saturday) we had our very last ski day. 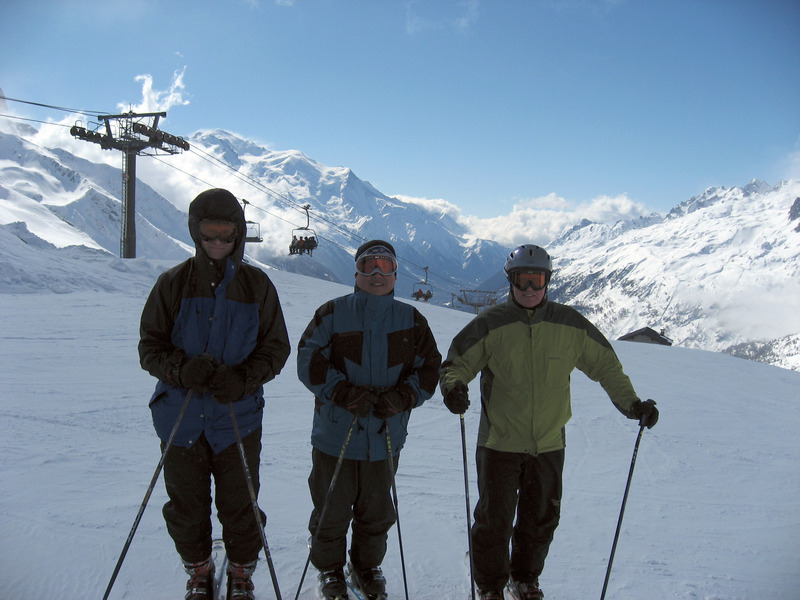 Lance and Lise went on their way, so it was down to Paul, Mike, Brady and me (Brian). 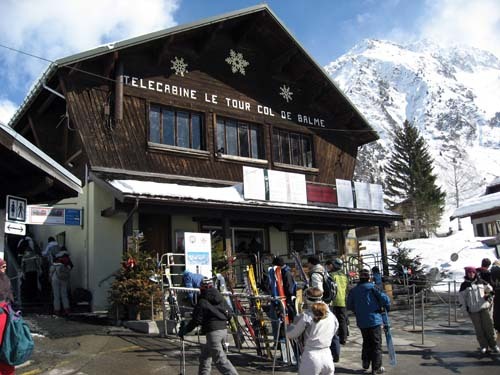 We decided to check out the ski area of "De Balme" which starts at the very small town called "Le Tour" which is 15 minutes away from Chamonix by a free shuttle bus. 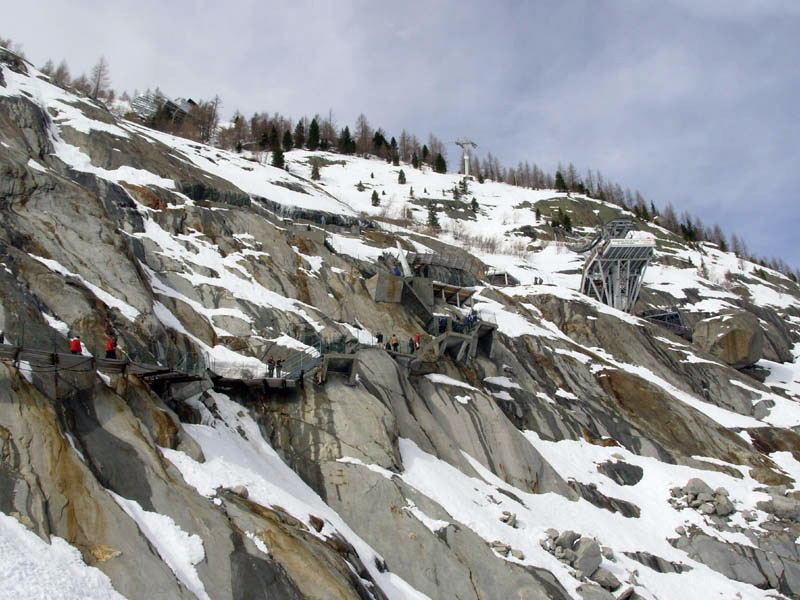 Below is the entrance to "De Balme" ski area near Chamonix, France. Riding up the main access gondola you can see the very tiny town of Le Tour down below. 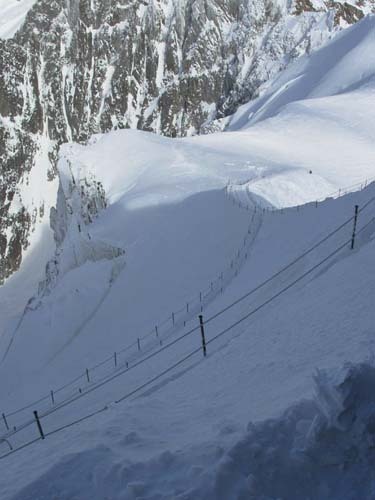 Chamonix can be seen further down valley if you squint. This is a lift map of the De Balme ski area, which is above the town of Le Tour, near Chamonix, France. A panorama from 3/4 of the way up the De Balme ski area, looking down the valley towards Chamonix, France. At lunch we stopped at the mid-mountain lodge at De Balme (seen below). Lunches at these French ski areas are about the same price as a lunch at a USA ski area, but instead of the awful food you get in the USA, the French have these marvelous choices and excellent food. I took a couple pictures to try to convey this, but you have to experience it to believe it. More gourmet French food in a ski slope mountain lodge. Wine selection with lunch. The wine is both excellent and inexpensive, it can be cheaper to have a glass of wine than a coke with lunch. After lunch, this is a panorama looking up the ski hill, taken from the mid-mountain lodge in the ski area of Le Balme, near Chamonix France. That's IT! The end of the final ski day of Chamonix skiing. 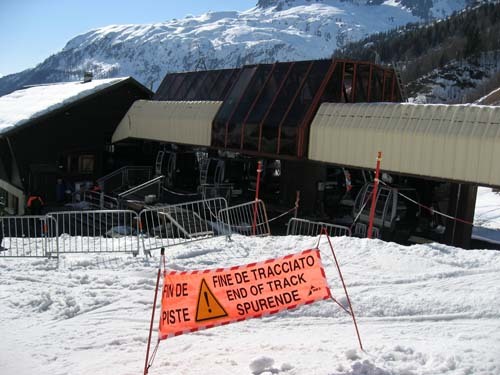 This picture below shows the sign at the bottom of the ski hill "Fine De Tracciato - End of Track - Spurende - Fin De Piste!" 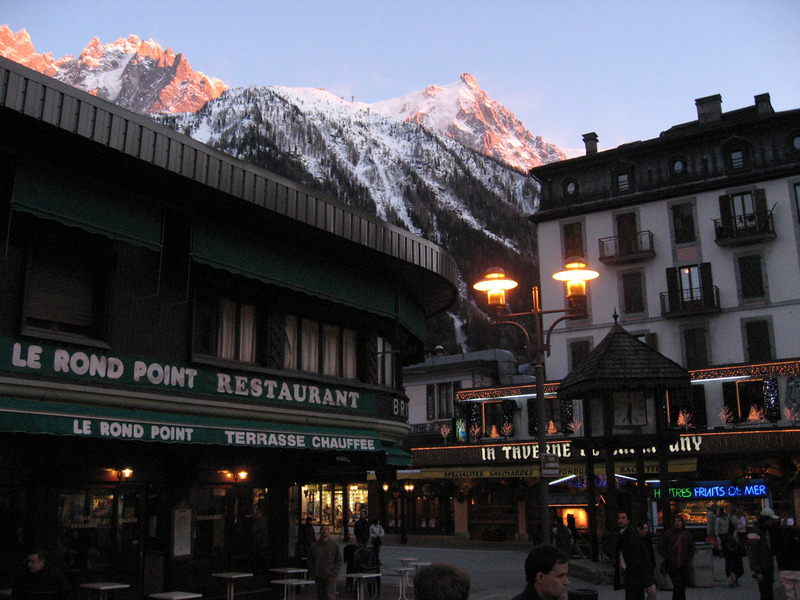 That night, as the sun goes down we walked through downtown Chamonix, France. 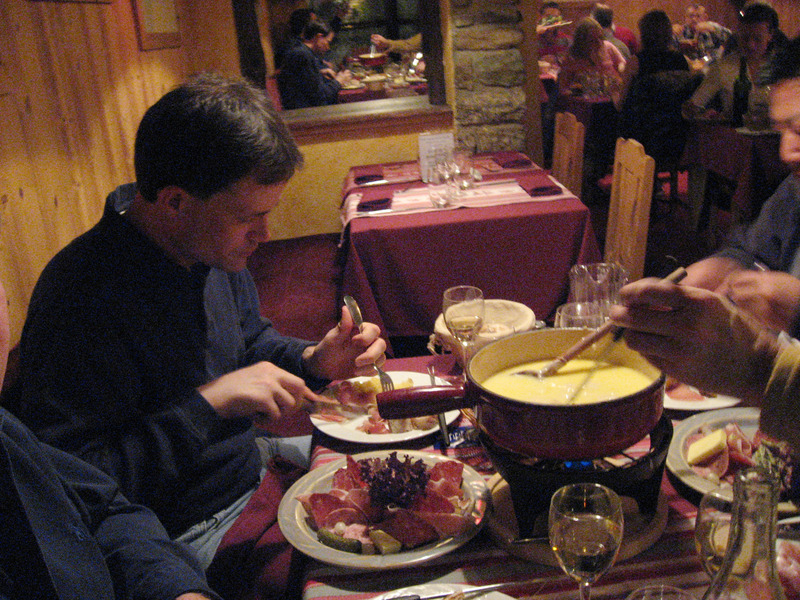 One last meal of French fondue in Chamonix, France. Brady on the left, Mike peeking in from the right, and that's Paul's hand stirring the fondue. 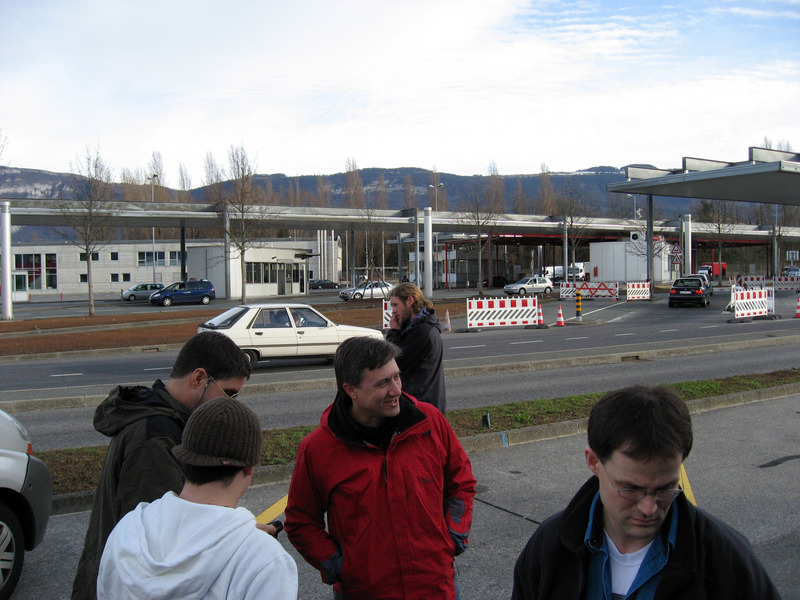 The next morning of 3/11/07 (Sunday) we got up, took a shuttle to the Geneva airport (1 hour ride), and flew home. Here are our bags outside the hotel. One last picture of our hotel ("Les Balcons Du Savoy") which is ski-in/ski-out to "Le Brevent" and "La Flegere" ski areas in Chamonix, France. 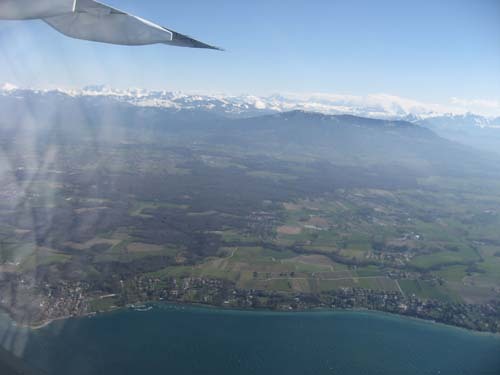 Taking off out of Geneva, Switzerland, looking down at "Lake Geneva" (also known as "Lac L�man" and "Genfersee" depending on your language). A final goodbye picture of the Swiss Alps below the plane. That's it! All finished! Below here are some notes for my safe keeping, not really part of this web page. 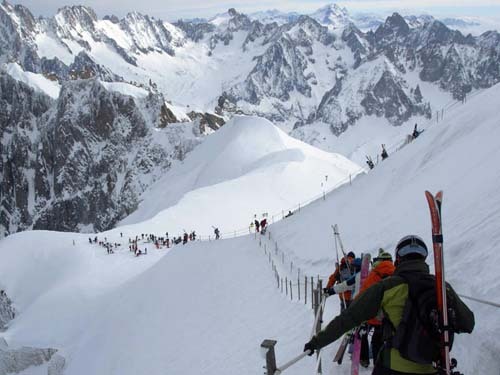 (100 percent off-piste skiing, intermediate ski slopes but with dangers of avalanche and crevasses so must take a guide, the one tram on this area is "Aiguille du Midi" which is the highest tram in Europe, the top of which is the start of the "Vallee Blanche" which is the longest ski run in the world).